I’ve put this together to follow on from the simple summary of the basics posted at the beginning of September. I know that glossaries like this are usually written after everything important has been said but sometimes it’s much more interesting to reverse the logical order. Besides, part of my purpose in writing things here is to organize information for myself and I find it easier to locate things if they’re arranged alphabetically. The lexicon is a starting point; a framework which will be built upon. For example, illustrations are certainly needed, but I have too little time to spare for these at the moment. This lexicon will go in the Technical Drawing section, but as usual I’m previewing it as a post mainly so that I can tag the contents. Breaking the line i.e. if a structure or distance needs to be shown condensed (because the whole can’t be fitted on the paper, or space needs to be saved). Shown with a wavy or jagged break line.. or two, spaced a little apart. Obviously this is only an option if no information is lost by doing this i.e. for a completely plain wall or a regular pattern. What’s most important is that the true length of the wall should always be clearly indicated with a written measurement. ‘Coding’ is a recognized term used in technical drawing to describe the cross-referencing of parts of a drawing, either within the same sheet (i.e. relating an elevation to its place on the ground-plan) or from one sheet to another, often when details of a structure in an elevation need to be drawn in a bigger scale on a separate sheet. One could just call this ‘labelling’ in normal language, but as the name implies shorthand letter codes are used rather than words and it relies on everyone understanding how to read them. Using just letters and numerals rather than descriptive words has proven more effective in practice .. they take much less time to write, and they are more easily found and recognized! For example, the simplest method when cross-referencing parts on the same sheet would be to label or ‘code’ a drawn view of a wall as ‘Elevation A’ and place the same ‘A’ beside its representation on the ground-plan. Both the style and the symbols do vary. In whatever case though, it must be made clear not only the direction seen from but also the ‘point’ in space seen from (especially with sections). ‘Coding’ when it means referencing a part of a drawing within a number of separate sheets of drawings must include both the view title i.e. ‘Elevation A’ or ‘Elevation A-A’ and the sheet number where the corresponding drawing can be found. Often this information is conveyed with a small circle cut in half with for example the elevation letter written in the top half and the sheet number below it. Connected (often surrounding the circle) is an arrow pointing towards what this relates to. Obviously one definite common sense ‘rule’ is that the letter ‘A’ or ‘A-A’ (describing the extent of the view) should only be used once on the same sheet, but it can be used for something else on a separate numbered sheet. Construction drawings Technical drawings are not, strictly speaking, construction drawings! They show what is to be constructed, but not how. In theatre/film/television it is generally understood that the designer’s responsibility extends only so far as to describe the visible form and not necessarily define how it will be constructed .. though it is certainly appreciated if the designer has some knowledge of construction methods, especially an awareness of what’s possible or reasonable! However, there are some common exceptions to this. For example, if a theatre set needs to be broken up into small pieces for touring (a fact which, hopefully, the designer will know before starting to design) it is not only pretty vital that the breaks are decided in consultation fairly early on, but also that the designer works them into the design and indicates them on his/her drawings. Often this will need to take account of standard sheet timber sizes etc. The more complete and accurate a designer can draw up exactly what he/she wants, the less work there is for the construction manager to convert what’s given into proper construction drawings. Drafting or ‘draughting’ if anyone is not content to use the simple word ‘drawing’ in this context, there is some confusion about which of these two other words should be chosen. There’s no difference in meaning between them. ‘Drafting’ implies mechanically assisted and measured drawing, while ‘draughting’ is the older English version which is steadily being replaced .. although ‘draughtsman’ still seems to be more commonly used in the UK than ‘draftsman’. A proper drawing board is considered the standard, indispensable investment for anyone who has to produce technical drawings. Apart from being a clean, flat, stable surface to work on which can be angled to make the physical act of drawing easier it is simply a tool for drawing right-angles and parallels. All manufactured drawing boards are sized in accordance with the ‘A’ paper sizes ( see ‘ISO 216’) .. that is, they’re big enough for that size of sheet with a few cms extra on all sides for taping. A drawing board is needed, whether one prefers to work with a simple board and separate ‘T-square’ to create right-angles and parallels, or whether one prefers a drawing board set up with integrated parallel bar or ‘parallel motion’ as it’s often called. The choice is not just financial! Parallel bar drawing boards are not as portable, and even the lighter, portable ones need to be moved with great care because the attachments, especially the taut wires which keep the bar straight, are sensitive. Some experienced ‘draftspersons’ argue that getting used to working with separate board and T-square gives more freedom and ease .. because for example the T-square can be used to draw both verticals and horizontals. On an integrated drawing board verticals have to be drawn using a separate set-square against the bar, making it often difficult to draw a full vertical in one pass. On the other hand whereas integrated drawing boards used to be quite pricey, there are now good quality inexpensive ones. Blundell Harling ‘Challenge’ A1 drawing board recommended as an adequate, inexpensive option. Has a convenient carrying handle. Needs to be looked after because the mechanism and parallel bar are the most basic and not super-durable. Normally parallel bars are not meant to be interchanged (i.e. they are calibrated in centimeters in case this is useful but normally the desired scale rule is placed on top for measuring work). There is no ‘feet and inches’ bar available. The ‘Challenge’ has only one moderately raked position. If you need one with more upright options there is the ‘Ferndown’ which is more expensive. Blundell Harling ‘Challenge’ A1 (£61.19 inc VAT graphicsdirect.co.uk, £65.99 amazon). ‘Ferndown’ with variable stand, costs more (e.g. RRP £120, £90 at cassart.co.uk). Prices from August 2014. The ‘Challenge’ represents the most reasonably priced and adequate. There are more expensive brands which include for example .. bar lockable in fixed position; more choices of working angle; bar can be adjusted either tight on the board or slightly away from it i.e. to accommodate drawing on thicker materials .. and so on. Clean board regularly (household degreaser or low-odour white spirit), check for smoothness and wash hands before working; covering the drawing board first with a paper underlay will result in stronger pencil lines and will also minimize damage to the board when using a compass; fix paper to board with small diagonal tape strips at extreme top corners (this minimizes parallel bar catching); avoid prolonged resting of hands on tracing paper (will quickly expand with heat and moisture, resulting in buckled drawing surface), position a movable hand rest underneath the drawing hand to help with this (just a scrap of paper), which also helps prevent smudging while working; vital to be able to work in a physically comfortable position, but in addition ‘stretch breaks’ must be regularly taken. If there are stubborn tape residues or sticky patches that do not disappear with soap/degreaser and water try either white spirit, methylated spirits or lighter fluid. I used to work with the paper taped down to the board in as many places as possible (or even fully taped on all four edges) in the hope it would stay flat, but nowadays I find that this just increases the effects of buckling. Tracing paper will always buckle with even the slightest humidity or moisture from the hand. Now I find it easier just to fix the paper at the two top corners, allowing the rest just to lie. When using an eraser, particularly a putty rubber, make sure that the parallel bar is first moved to the top so that particles of rubber aren’t allowed to fall between the bar and the board .. they’ll most probably stick there. The ‘upright’ views .. i.e. front view or side views, in everyday language .. are commonly called ‘elevations’ in technical drawing, because they’re usually taken up or ‘elevated’ from the ground-plan. Wherever possible this relationship needs to be maintained on the sheet, for a number of reasons. In the first place, if dimensions are plotted on the ground-plan first they can be reproduced on the elevation just by using a set square and without the need to measure out again. Secondly, if the two views are in exact alignment it’s much easier to read them in conjunction to explain features. Elevations are always drawn straight-on, seen totally frontally .. in other words using parallel projection. This means that parts of a wall which are angled away from this frontal orientation will appear ‘condensed’ in the elevation. It is important to realize that this is not ‘perspective’ distortion, and that it is entirely logical for this type of drawing. Usually when this occurs the elevation should always be accompanied by the ground-plan, or part of it, so that the true dimension can be shown. Anything that has required the positioning of a centre to draw it has to include the clear position of that centre on the drawing, usually with a precise but definite ‘X’ cross and a dotted line linking that to the curve it relates to, and with a written measurement for this radius marked with a small ‘r’. Unless of course .. the circle is very small in which case just the diameter is given, often with a little symbol like an ‘o’ with a line through it. If you need to find the centre of a circle: pick two points on the circumference, draw line between them, bisect this line and draw right-angle from that point. This line will pass through the centre. If you do the same from another part of the circle, the centre will be where these two lines cross. A 45 angle can be made by drawing a regular square and drawing a line between opposite corners. A 60 angle can be made with a compass; drawing a base line (length doesn’t matter), putting the compass point at one end and the lead point at the other and drawing an arc upwards a little over quarter-circle, then doing the same in the other direction on the base line. Where these arcs intersect is now the top point of an equilateral triangle so if you join the points up all the angles are 60. It is generally accepted that the ground-plan is ‘viewed’ in the drawing from ‘eye-height’ .. that is, the eye-height of a person within that space, but being able to look completely down on it .. and that walls are sliced through at roughly this height. So no, we are not looking down on the top of the building like a bird, but neither are we looking at just the ‘footprint’ left on ground ‘0’. Instead a ‘level of most information’ is taken, meaning that we can include more details through window structures for example. It is also generally accepted, at least in the UK, that when ground-plan and elevations can be drawn on the same sheet the ground-plan occupies the lower part and the elevations are placed principally above. On the ground-plan even the slightest floor-level variation should be indicated and each height is taken from ‘0’ being the stage or studio floor. The plan should not be cluttered with too much overhead info .. if there is a lot of this it is better to draw a separate upper-level view. Where there are doors which are ‘practical’ i.e. can be used, there should be an indication of direction opened and preferably an arc showing the extent. ‘Master’ ground-plans differ from the ground-plans of individual set elements in that they are often a summary of a whole show set-up or a whole scene .. so they include information on the movement of elements; they relate the set to features of the space i.e. position of traps underneath and lighting or flying bars above etc. The international standard for metric paper sizes is known as ‘ISO 216’ (ISO stands for ‘International Organization for Standardization’). Developed in Germany in the early 1920s and since adopted by most countries. An A0 sheet measures 1189x841mm precisely, because this is as near as this comfortable ‘landscape’ format can get to a square metre in area without using fractions of a millimetre. The format (the proportion of length to width) is special in that when it is divided in two across its length the smaller sheet retains the same format, and so on .. dividing down from A0 to A5. So A1 measures 841×594, then A2 measures 594×420, and so on. That 1 millimetre has to be lost from the length of A1 on the way down because it can’t be divided .. if anyone ever wondered about that. The system was designed so that paper manufacturers could manage paper more precisely by weight. It means that an A1 sheet can be counted as half the weight of an A0 sheet while an A3 sheet can be counted as an eighth, etc and so on. The fact that the ‘A’ range keeps its proportion means that the contents of the sheet can be enlarged or reduced from one ‘A’ size to another while the drawing or image still fits exactly as before to the paper. A common mistake though is to assume that, because two A4s make an A3, an A3 must be twice the size of A4 i.e. 200% on a photocopier when in fact it is not! It is twice the area but not twice the length and width. But the next-but-one size is 200% .. so for example if you need to enlarge an A4 drawing by a full 200% it needs to become A2. ‘landscape’ format Technical drawings are almost always drawn in ‘landscape’ format ..even if ‘portrait’ format may seem an advantage when drawing up a tall structure. Obviously this arises mainly from the design of drawing boards .. ‘portrait’ orientation of the board is not possible. To manage an A1 drawing in ‘portrait’ orientation one would need an A0 drawing board and this is too large for most people. It also has to do with standard worktable or desk formats .. spreading out ‘tall’ drawings to look at them may not be easy! The accepted layout of parts of the drawing on the sheet is a result of three things .. the conventional layout of parts for an orthographic projection (see entry) .. ground-plan, front view, side view; the easiest way for the drawing to be drawn in practical terms (being able to extend the same lines through different parts and therefore save on having to measure again each time), and the clearest relationship of parts for the viewer (being able to relate features along those common lines). But at the same time enough space needs to be left between parts of the drawing for ..often .. more than just one string of measurements and other written information. Layout has to be rehearsed rather than made up/added to as one goes along. It is not necessarily easy to achieve a balanced layout i.e. one where the parts are close enough to read the relationship but not so close that they encroach on each other. The easiest way to rehearse this (rather than draw/erase different outline possibilities on the full-size sheet) is to make up a smaller ‘model’ i.e. 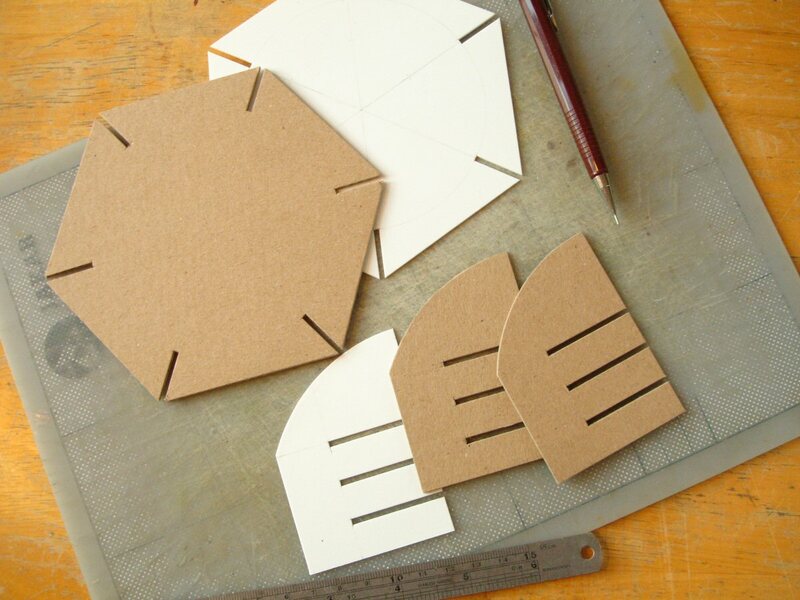 smaller-scale paper cutouts of the principle views needed together with a similarly reduced sheet so that positions can be easily played with. Another easy way using SketchUp is to mark out a sheet size i.e. A1 or A2 in ‘scale’ within SketchUp on the ground plane, make outlines of the views required on that sheet and use the ‘Select’ and ‘Move’ tools to move them around until they look comfortable. One of the most important aspects of this initial rehearsal is establishing a fairly clear idea of just how many separate views, including cut-through ones or sections, are needed to convey complete information. Simple geometric shapes will need just three as a rule .. a view from above, a view from the ‘front’ and another from the side. But set designs are not simple geometric shapes, and even a simple block structure may have different detailing on each surface so the views required can be many more than three. Sometimes there may be a choice or doubt as to which view should serve as the main or ‘front view’. It should be the most informative view, most representative of the overall structure (i.e. a car is always shown from its side). It should also be an angle of view in which the principle structure can be drawn ‘frontally’ if possible i.e. aligned parallel to the viewing plane. There may be many variations on a basic principle (think of the number of different ways you might separate the sides of a box) but usually the ground-plan, being considered the foundation of everything, is placed quite logically at the bottom-centre. It makes sense that the number of separate sheets conveying a set design should be kept to a minimum not because of printing costs but as ‘containment of information’. Therefore it is normal to try to fit as much as possible on the drawing space. But there is no need to take this to extremes .. as is sometimes done! It all needs to stay comfortable and above all .. clear! Technical drawing is a language of lines, quite literally because the reader of the drawing needs to rely on the fact that every line on the object visible as an edge is shown unless clearly stated, so if something is missing it throws the sense out and introduces doubt. After layout, the quality and meaning of lines in the drawing is probably the next most important aspect. Lines signifying visible edges can also be termed ‘object lines’; sometimes a bolder line for principle architecture (i.e. the ends of walls or structures), a thinner line for details within that. Varying line thickness, or line weight as it’s referred to, can make a structure more readable and add the illusion of depth to the drawing. One of the many advantages of drawing in pencil is that the line weight can be modified in more than one way; the thickness of the lead, its hardness i.e. 2H, HB, 2B (going from hard to soft) and the pressure exerted while drawing. Some ‘draughtspersons’ make a point of emphasizing the beginnings and ends of lines with a little more pressure. They also claim it looks more human, or elegant .. it gives more character, personality. Lines can ‘direct the eye’ by being more than just ‘a line’ between A and B. Every practised draughtsman will have their own preferences and advice re. lead strengths to use for different elements of the drawing .. here is another version .. ‘4H mark-up lines which are not meant to show; 3H 0.3mm for the thinnest visible i.e. dimension lines, dashed lines; 2H 0.5mm general inc. visible detail; H 0.9mm strongest lines, i.e. outlines, ‘solid’ look hatching. Probably the best advice though is to test the various possibilities (different lead widths, hardnesses and pressure applied) yourself to find what you’re most comfortable doing and .. importantly .. have a copy made at a good reprographic shop (i.e. a dedicated printing/photocopying outlet) to see what results you can expect. Lines signifying hidden elements , structures at other levels or imaginary reference lines are always dashed or dotted to distinguish them from visible lines. For example, centre lines commonly drawn on stage ground-plans always alternate short-dash with long-dash and include the letters ‘CL’ written at least once. Hidden lines are most often pulses of short dashes. Phantom lines i.e. showing alternate positions of objects, often have two short dashes then one long dash. Some people try to distinguish the ‘hidden’ lines representing something obscured from view from those representing ‘beyond viewpoint’ by making the latter long dashes instead. The language of technical drawing strives to be universal .. at least international .. but there is inevitably variation, even based upon personal preference. Usually this is no problem .. as long as the chosen methods are used consistently. This is just a selective summary on the subject of lines .. there are many others .. but one final one deserves a mention. It is common practice to finish off a sheet with a border-line (usually just a centimetre or so inside the edge of the paper). Although this frame enhances the drawing it has a more practical purpose. It makes it clear, when the drawing is copied, that the sheet has not been cropped and nothing is missing. Before recent improvements in photocopying, drawings always had to be made on transparent paper (commonly known as tracing paper or draughting paper) and almost always in ink, so that they could be reproduced by the dyeline method. Now drawings made on normal white paper are just as easily replicated. But there are many advantages to being able to trace when working on a technical drawing i.e. tracing from other drawings, tracing printed lettering, tracing repeated elements, and so on. Tracing paper also generally remains cleaner or at least can be cleaned more effectively. Even thick pencil lines can be removed with no trace and ink can be scratched away (though this is rather painstaking) with a scalpel or razor blade. However there are drawbacks, especially when using ink. The paper surface should not be touched too much because grease from the fingers sits on the surface and interferes with the ink. Hands must be rested while working on piece of scrap paper or cotton gloves need to be worn. Drawing originals should never be folded (as this will affect how they reproduce) whereas white paper copies normally are (folding so that title block is visible). If white paper copies are stored as rolls the printed surface should be facing outwards so that, when unrolled, it will be easier to flatten them. Tracing paper comes in different thicknesses. The thinnest is c. 60gsm (grams per sq metre), too thin and fragile for display itself and will buckle a lot while working. It is cheaper of course, so this paper is most often used for working drawings or ‘roughs’. At the other end 160gsm will stay fairly flat and presentable, but this can be even more difficult to work on if it buckles. I find the standard one in between .. 90gsm .. to be a very ‘happy medium’, strong enough to survive but not so thick that it refuses to lie flat after it has been stored as a roll! On the whole it is not wise to display original drawings done on tracing paper. However thick, they will be affected by heat and humidity, and although they may have an ‘agreeable’ look the lack of contrast can make them difficult to read. It is better to mount a good copy on foamboard. If the decision is made to work on white paper the sheet size needs to be checked to make sure that it conforms to an ISO standard .. i.e. either A2, A1 etc .. otherwise there will be problems when machine copying. Bartoline Low Odour White Spirit recommended for cleaning drawing board surface or even smudged tracing paper (also to degrease) because this will not warp the paper. The inclusion of written measurements is a fundamental which distinguishes a technical or ‘measured drawing’ from any other type of drawing, that coupled with the fact that all structures are conveyed frontally in an exact and consistent scale without perspectival distortion. In the UK it is customary now to write all measurements in millimetres .. so 3metres and 25.5cm is written simply as 3255. This is in the interests of greater accuracy, but I guess it’s also meant to be clearer and unequivocal for the reader. It is also common practice though to round-off fussy measurements .. for example there’s unlikely to be a good enough reason why a 10505 wall can’t be 10500. Although technical drawings are done to scale and the lines can be measured, thorough written measurements are also necessary because copies of drawings (by whatever method) can distort i.e. stretch a little. The copy needs to be checked in this respect before any independent measuring is done. Sometimes large drawings may be printed out at a reduced size, purely for information and not meant to be measured from .. if there are no written measurements on the drawing it may not be possible to check whether this has been done! It is traditional practice to align written measurements to be read ‘from bottom upwards’ and ‘from left to right’, just those two directions, rather than following all four directions. Often space will dictate whether the measurement values should be written parallel to the measurement lines or at a right-angle to them, but where possible they should run in the direction of the line. Also, detail measurements are positioned closest to the object, followed by larger measurements, then an overall measurement. The reader should be able to locate the overall dimensions easily, without having to search. The question of whether the numerals should be written above or below the measurement line, or whether there’s a gap in the middle to insert them, is purely personal preference .. and in this case can even be varied if need be according to available space. There are many different ways of doing this. It’s one of the advantages of drawing on tracing paper that one can lay another drawing underneath and trace over it precisely. When this is not practical .. one can use dividers, compass or just mark points on a paper strip. I prefer using the paper strip method to the numerical i.e. measuring a distance on the working drawing, storing it in short-term memory, then measuring out on the final drawing .. too many things can go wrong in the process! Easily identifiable moving parts such as hinged or sliding doors are often represented clearly in one position with an unbroken line, but with a dotted version (usually of their closed position) and with an arrow indicating the direction of movement. With regular hinged doors this arrow takes the form of an arc and it’s advisable to indicate the maximum that a door is meant to open, partly to clarify what possible obstruction this may cause, and to check that the doors themselves don’t clash! Orthographic projection is the name given to the way three-dimensional structures are represented in 2D in a technical drawing, by means of multiple views involving completely parallel viewpoints and without perspective distortion. ‘Orthographic’ here simply means ‘at a right angle to’ or perpendicular to. Representing something ‘in scale’ means that the subject is reduced according to a fixed ratio and that every part of the subject gets the same reduction. So for example if something is drawn half its real size the ratio is 1:2 .. ‘1’ representing the actual size, and ‘2’ representing the number of times that the drawing is smaller. So 1:25 means that the drawing is 25 times smaller than the real thing. A good mindset while drawing is to say to oneself ‘Every centimetre I measure on the paper represents 25 centimetres of the real thing’. The scale chosen should depend on the detail necessary to give a complete account of the build i.e. very simple structures could be conveyed in 1:48 (‘1/4inch’) or metric 1:50 without the need for larger scale details, but period architecture (which normally includes specific detail in doors and windows) is better conveyed in 1:24 (‘1/2inch’) or metric 1:25 .. at least for most of the main structures. Details such as specific wall mouldings (decorative profiles) have to be described in an even bigger scale such as 1:10, even 1:1 if necessary. If you own and have room for a sizeable drawing board, i.e. A0 size, a lot can be fitted on one sheet. But if you are limited to A1, as most people are, it would be a big mistake to choose a smaller scale just to fit more in. As I say, the scale should be chosen appropriate to the detail necessary, not the working conditions, so in this event it means spreading the work over a number of sheets. In other words .. whether one should work in metres/centimetres or feet/inches? I have heard said a number of times, something along these lines .. ‘film uses Imperial scale around the world; metric is the standard for architecture (except in the US) and for theatre design in the UK; television uses both, except for the BBC which has its own scale rules’. What I’ve yet to hear though is an acceptable reason why film drafting should be in Imperial around the world! In the UK we should all commit to metric .. as we were supposed to do back in the 1970s! At least we should commit to something! .. the current ‘hotchpotch’ makes little sense and will just create more confusion the longer it continues. There’s some value in having an awareness of feet/inches in terms of understanding some traditional standards re. architecture and furniture. There’s also an aesthetic appeal in being able to divide feet just as smoothly into thirds, as halves or quarters. But metric is more smoothly divisible, hence easier to work with, when it comes to the usual scenic or spatial design scales. You have to decide for yourself! .. or rather, according to what you’re most comfortable with but also taking into account the consensus of the people you’re doing the drawings for. It’s difficult to argue with a solidly-built workshop chief who insists on Imperial .. you either have to design and think in Imperial from the outset or design and draw up in metric then convert. If you go for the second option, unless you’re convinced that the workshops can afford to care about every nuance of your design as much as you do .. you should convert your drawings yourself. Then the whole drawing needs to be copied at a different value to 100% i.e. if 1:25 is to become 1:24 it means that the drawing needs to be enlarged by a certain percentage. Divide 24 into 25 to give 1.0416 which is (near enough to) an enlargement of 104% .. in other words 4% bigger in common language. See ‘Working in scale’ in the ‘Methods’ section for more on scale conversions. If you’re just doubling the scale of a drawing .. whether Imperial or metric .. here is a cautionary word. A surprising number of people think that an A3 sheet of paper is ‘double the size’ of an A4 and that pressing the ‘A4 to A3’ enlargement button on a photocopier will enlarge whatever is on the sheet by 200%. In fact an A3 sheet is just double the surface area, not the dimensions .. the percentage enlargement while keeping the same format is actually only a little over 141%. Place an A4 sheet on an A3 while keeping the same landscape orientation and you’ll get the idea. To fully double the size, i.e. when converting a 1:50 scale drawing to 1:25, you would need to go from A4 to A2. Just think of ‘section’ as short for ‘cross section’..
Often the most effective way of representing a complex shape is to show what it looks like ‘cut through’, exposing the interior but also revealing the shape. Cuts through a solid are most often represented by diagonal hatching (though sometimes by solid infill). Diagonal hatching originates from wood construction, the hatching mimicking a saw cut. Often the outline of the ‘cut’ surface is drawn with a bolder line to emphasize it against the hatching. The ploy of hatching on the reverse side of the paper when working in pencil (to prevent smudging) should also be noted here. It is not always immediately obvious where the most effective point might be for a sectional view .. it should be thought about .. but the point of ‘most information’ should be chosen. Sections are often placed to the right side of the sheet, or rather the right side of the elevation they apply to, simply because this is the direction in which we’re used to reading. Most often the hatching lines follow a 45 degree diagonal, but sometimes a 60 degree angle is chosen. Another common practice is changing the direction of the hatching to indicate separate elements of a cut-through i.e. to differentiate wall mouldings from the underlying wall. It is best to avoid varying the direction of the hatching too much though, otherwise clarity is lost in the visual ‘busy-ness’ this creates. Just as important in clarifying a section is showing clearly where the ‘cut’ is placed i.e. its exact position in the structure, and also from which direction it’s being viewed from, by means of coding symbols. Steps and levels It is generally agreed that steps or levels indicated on the ground-plan should include their heights clearly and that this should be written on the step or level drawn, rather than to the side of it. There may be some variation as to exactly how these are displayed. The most accepted method nowadays is to indicate each height starting with a ‘+’ so that a 200mm step up from the floor would be written ‘+200’. Most importantly these heights are all individually taken from the same ‘0’ level i.e. the stage or studio floor, so that a flight of regular steps would read ‘+200’ on the first, ‘+400’ on the second, ‘+600’ on the third and so on. If all the steps are mounted upon a platform, i.e. even a small 100mm one, this would be added, so that the first step would now be ‘+300’ and the second ‘+500’ etc. This means that we know the relative height of all steps and levels in relation to each other .. in much the same way as mountains ‘above sea level’. As mentioned elsewhere .. there should be room for personal style .. there is certainly room for personal style! There may be no absolute necessity to represent surfaces or materials in a graphic way (as long as that information is noted somewhere), but it can enhance the drawing, even make it clearer. There is a lot of freedom in representing surfaces, such as a decaying brick wall or bark of a tree, by whatever means you choose as long as it’s not misleading (i.e. it should stick to the intended appearance, rather than too graphically stylized) and as long as it will copy well. Most often only a representative portion of a significant surface needs to be indicated, such as brick pattern on the bottom left corner of a wall elevation. Filling the whole of the wall surface with this pattern may diminish the clarity of other details. Window areas which are to be ‘glazed’ are commonly represented by 2-3 short diagonal strokes in each pane, or just the word ‘glazed’. Again, this is not a necessity but one can choose to include a figure to represent scale and it is well worth it in some instances i.e. showing clearance under overhead walkways or stair units. Obviously if a figure drawing, in whatever style, is included the most important thing is that it represents an ‘average’ in terms of size. According to the US publication Interior Graphic Standards the current height average is 1.75m for a male, 1.63m for a female. 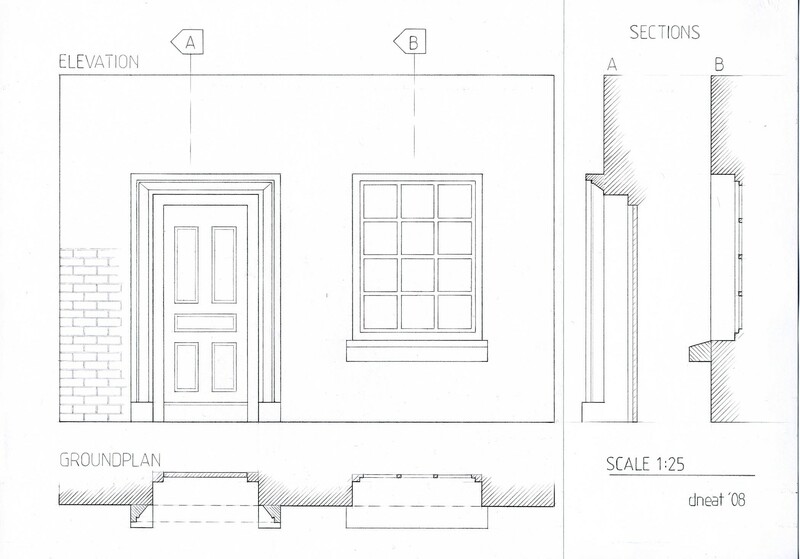 Inclusion of isometric or perspective drawings is not a common practice, but they can enhance the drawing’s effectiveness and appeal .. it can make what is being represented much clearer, sometimes dispelling confusion and preventing error! A simple perspective representation is nowadays very quickly achievable using SketchUp, and this can be printed out and traced onto the drawing. See ‘Some of the principles of technical drawing simply illustrated – Part 1’ for an example of the use of this. i.e. anything on the drawing which needs to be expressed in words as opposed to numbers, using where possible regular ‘everyday’ words rather than jargon to convey information. All writing should be in straightforward capitals. Title block or ‘title box’ containing production title, drawing title (if not prominently elsewhere on the drawing), name of designer (production designer, art director), drawn by, date (or dates), drawing number in the series (i.e, ‘Drawing 1 of 5’), principle scale (other scales may be indicated next to part of drawing). The title block is often consistently in same place (usually lower right corner) so that it can always be looked for there, and so that it’s visible when sheet is folded in the standard way. If there are lots of sheets, it may be worthwhile to design ‘sheet number’ to read larger, so that it can be more immediately seen. Really the only important objective in terms of lettering method is that the words are easily readable. Anything that conflicts with this is a mistake. Anything that takes too long to create is also .. realistically speaking .. a mistake. Rather than spend so much time mapping out guidelines etc. for the even shape and spacing of lettering why not print out the words or sentences you have to include in a clear, simple and enlarged font, place underneath the sheet and traced from. There are good quality plastic stencils available for smaller lettering i.e. for technical notes and writing dimensions. Notes can be very important, but it needs to be left to basic common sense in deciding whether a note is necessary. Writing them can take a long time especially if a stencil is used and too many notes can obscure a drawing. Sometimes an area underneath the title block is reserved for general written notes, sometimes areas next to separate views .. whichever may be better i.e. less cluttered. Soft white type best when working in pencil. ‘Putty rubbers’ are particularly recommended when working in pencil on tracing paper, though the rubbers themselves may be harder to keep clean. There is nowadays less need for drawing in ink because reprographic processes are much better at recording pencil lines clearly! However, if you love ink .. Rotring pens can be the most satisfying option, although they are expensive and need an awful lot more maintenance than Rotring says! My feeling is that the far cheaper and easier ‘fibre-tip’ drawing pens always look a bit fuzzy and the lines are weaker. Using ink at least removes any doubt as to whether, however thin, a line will be picked up by the copier. A common problem when working with ink pens (though not so much with the fibre tip) is the ink being drawn underneath the edge of the ruler (or set square, or French curve etc.) if the nib is placed too close. For this purpose good rulers or set squares often have at least one edge which is ridged to prevent this, but it never completely eliminates having to be careful. Rotring pens do not give any problems if they are used regularly .. i.e. at least every week. However, if they are left for months the chances are that the ink which remains in the ‘hypodermic’ like nibs will dry to the extent that the only option is to replace the nib, and unfortunately this is almost as expensive as buying the whole pen! Recommended for taping sheet to board rather than ‘sellotape’ which can be difficult to detach from the paper without tearing it. HB standard, H for fine detail lines (even up to 3H), B-2B for heavier lines. 0.5mm thickness also standard. Mechanical pencils are always better because they give a constant line width and the cheapest ones are adequate (except that many of the cheapest sold in multi-packs have a 0.7mm lead which I think is a little too thick for detail work. I also like using a 0.3mm pencil for even greater accuracy and line-variety, but these are only available as £4-5 versions. A large set-square (transparent plastic triangle) is essential in combination with a parallel bar or T-square and an adjustable one is also often essential. Can buy just the adjustable rather than both .. but you should know that the adjustable ones are made of a much heavier, thicker plastic. On the whole I’ve found it trickier to draw verticals with them and I need to take extra care that they don’t slip off the parallel bar. Why are there 45 degree set squares and 60 degree ones? A ‘45’ can be used on the parallel bar to create diagonals in either direction (in addition to 90 degrees) and it sits more stable, but it doesn’t have as much vertical reach as the long side of a ‘60’. The ‘60’ can also be used for 30 degree angles, but not for 45 degrees. Linex ‘College’ brand, clear light-brown tinted. Good weight and thickness .. not too heavy, not too light. Reasonably finished edges. The 45degree ‘36cm’ size is a good large average without being unwieldy, combining fairly good reach with stability (36cm is measure of longer diagonal side, as with tv monitors). £7.32 at LGC, hellermans.com £4.74 (£3.95 plus VAT), cheapest seen for £4.27 on eBay August 2014 (not inc. postage). A long T-square is necessary if you’re using a plain board without parallel motion bar. If the board is on a stand which allows it to be placed jutting slightly over the table edge, the T-square can be used on all four edges of the board in other words for vertical lines as well as horizontal. This is often the term used to refer to drawings done purely for the purposes of working out during the design process, including in other words ‘rough’ or ‘sketch’ drawings, as opposed to ‘finished’ or final drawings. Just as the process of model-making often involves two phases .. one more exploratory, rough or sketch-like, for working out or developing ideas and the other ‘final’, perfected and complete .. the process of technical drawing can be similar. One difference though is that if the designer has chosen to explore and then perfect in model form first, the technical drawing may just be a straight transcription of information with little adjustment needed. On the other hand many designers, particularly when working to the often tighter deadlines of film and television, prefer to work foremost from the drawing board. Here it is common practice that whatever ‘models’ are produced actually come after the finalization of the technical drawings .. the so-called ‘white card models’ which are 3D pasted versions of the drawings themselves, to give a more identifiable spatial rendition of the set. A strong word of caution about working solely from the drawing board! Many professional designers recommend it. How did they get to be ‘professsional’? .. over a length of time and through a great deal of hands-on experience. One needs a very practised familiarity with scale, proportion and real spatial relationships to be able to judge a spatial design purely on the basis of drawings. In my experience any beginner attempting this will just be pushing the ‘cart’ out .. entirely without the ‘horse’! My recommendation, always, is to utilize both design tools .. drawing and model-making .. in conjunction from the outset. Even the roughest, quickest models will furnish a truer sense of space, while at the same time measured drawing is indispensable, for example working out stair units or rakes, or proportioning wood panelling. SketchUp provides an excellent means of ‘modelling’ by drawing .. The first thing that books on technical drawing should tell you is that after you’ve got all the ‘knowledge’ or theory, and you’re familiar with the ‘rules’ etc. the most important resource while actually doing it is .. thinking a little bit like a ‘drawing machine’ .. thinking very methodically. What I mean is .. how a machine might manage tasks i.e. doing all of one task first then moving to the next. For example, wait until you’re ready to write in all of the final measurements then do it all at once. It makes sense to enforce a somewhat ‘blinkered’ mentality rather than ‘roaming’ around the drawing or flitting from one type of task to another. Comfort/posture (but not too much comfort, keeping mind awake); lighting and direction of light; organized/uncluttered space, remove anything not immediately needed .. helps with focus. Unless you’ve got a particularly long worktable you’ll find that there’s not much side space left once an A1 drawing board is on it. It’ll save a lot of frustration to have a raised place (a trolley, platform, flat chair) to put all pens, geometry tools etc. in easy reach otherwise things get lost under drawing board and won’t stay on top of it. Some prefer covering the board with a sheet of white paper, because the slight ‘give’ strengthens drawn line and pen work is not so ‘scratchy’. Cheap (£shop) masking tape is probably best for securing drawings since it’s particularly low-tack, removable. If working in ink on tracing paper, do not rest hand on paper because grease will prevent the ink from properly taking. Have either a piece of paper or set square underneath. There isn’t this problem working with pencil. Never push a compass point into the drawing board. Two pieces of masking tape should be fixed underneath where the centre is on the drawing and this will be enough purchase for the compass point. Adequate lighting, especially direction, can become very important! i.e. if right-handed, light coming from top and left. Having a built-in familiarity with standard dimensions and proportions is of vital importance, but takes a while to acquire. In the meantime it’s usual to have scale figure drawing close by, or even one of a chair or similar familiar reference object. When doing finished work in pencil and doing areas of heavy shading or hatching, these can easily become dusty with graphite particles and easy to smudge. A clever idea is actually to do these areas on the reverse side of the paper so that they’re protected, at least while drawing. I am about to do some sessions in basic model-making for 3rd year architecture students at London South Bank University. What follows is a version of the session notes together with photos of the practical examples, and some step-by-step demonstrations of how to work with the material. This is intended as a point of reference for the students afterwards and it may repeat information given elsewhere on this site. Models are by default ‘looked down upon’ because of their size! They can provide an instant overview, with the precision of a groundplan in three dimensions .. they flatter us with a ‘god’s eye view’, and one needs to be reminded that this viewpoint is an artificial one. For example in theatre design this is can lead to design problems .. at normal table height the designer working on the model has an Upper Circle view of the stage most of the time. But in architecture one could argue that viewpoint is less of a consideration anyway, because in this context models are never meant to be realistic simulations and it would in any case require an impossibly huge model to reproduce anything like a pedestrian’s experience of the building. For reproducing these impressions, and to preview and rehearse the organization of interiors, digital simulation may be far better suited. But even though our relationship with the card model is very removed from the one we would have with the real building, it’s also very direct .. because of its real physicality. It’s made of material .. just as we are. It needs to be handled with care because it’s vulnerable. It responds to changes of light through the window or to the shadows cast by people moving around it. It’s physicality can even be enhanced by imperfections, to a certain degree, because we’ve come to expect them in physical things. For the first session I’ve chosen to focus on working almost entirely with ‘Kraft board’, which I feel is a very honest, unpretentious and direct material. 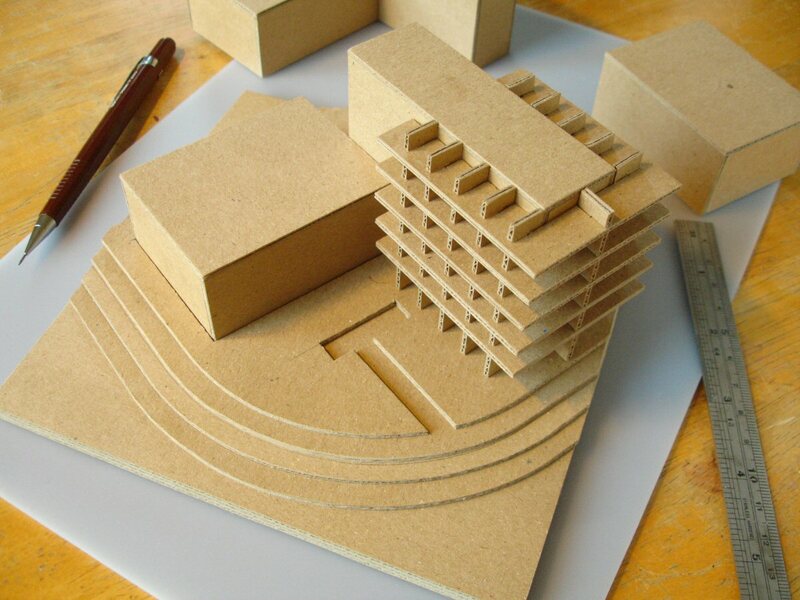 As I’ve implied my emphasis is also on small-scale ‘massing’ models, concentrating on essential form rather than detail, serving as preliminary or idea-development models within the process. These models are more than private sketches .. they are meant to present the status of ideas so far, to communicate them to others in a clear, controlled and deliberate way. The keyword here is deliberate! Although the work may still be in progress and not yet finalised, the statements made by the model should look valued, cared for, sufficiently thought about .. in other words, deliberated. On the other hand, there should still be a feeling of ‘sketch’ .. using a fine material for this would impose a false sense of finality. So the object is to achieve a model which looks presentable and reasonably sure of itself, but also still open to discussion and without having cost a lot of time, money or effort. 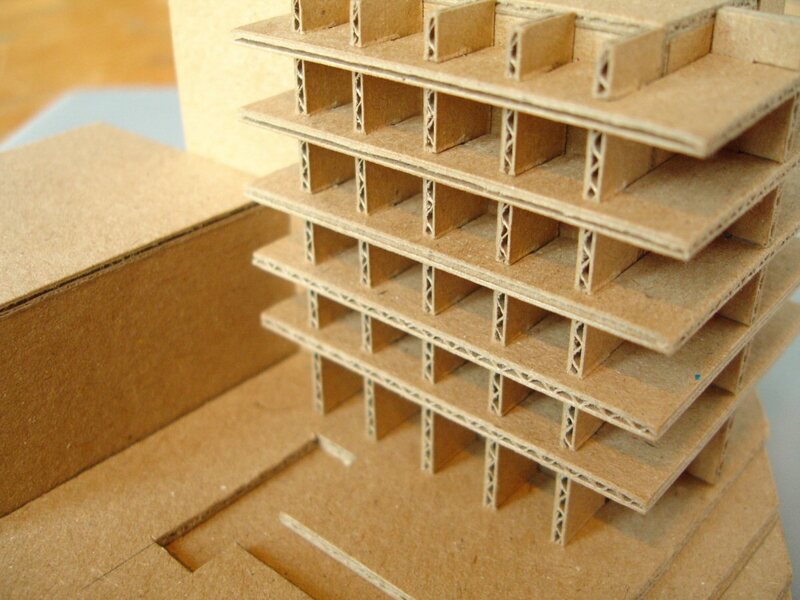 ‘Kraft board’ lends itself very well in this respect, because although it is structurally very strong and easy to cut cleanly, surfaces and edges retain a typically raw and recycled look. Cut edges cannot be made to look 100% smooth and detail is difficult beyond a certain level .. both of which can actually support the general aim. I’m assuming you probably don’t know what I mean by ‘Kraft board’. It’s unlikely that you do, because it’s the name given by the one supplier I know, Seawhite of Brighton, to a very thin form of brown, recycled cardboard which is made up of thin layers and corrugated on the inside. 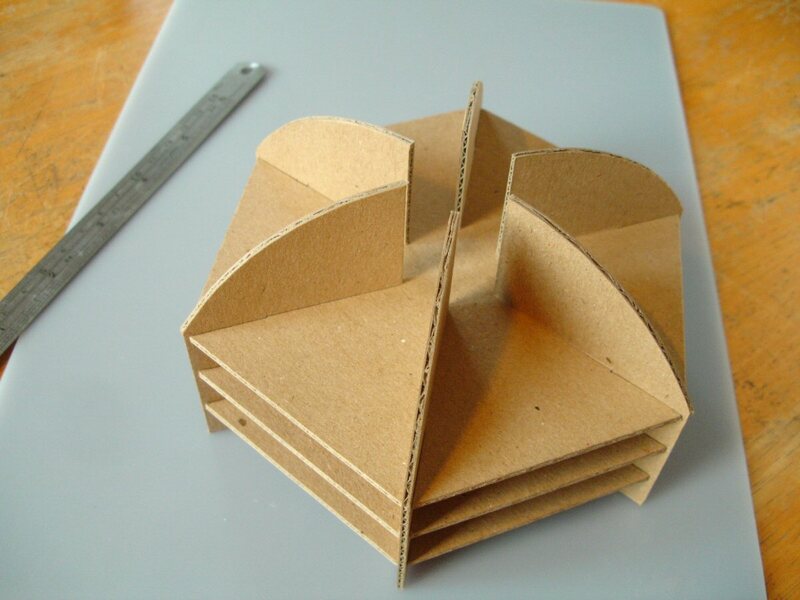 The outside is smooth and firm, but matt and untreated (different from the usual, thicker form of corrugated cardboard used universally, which has a very slight sheen). 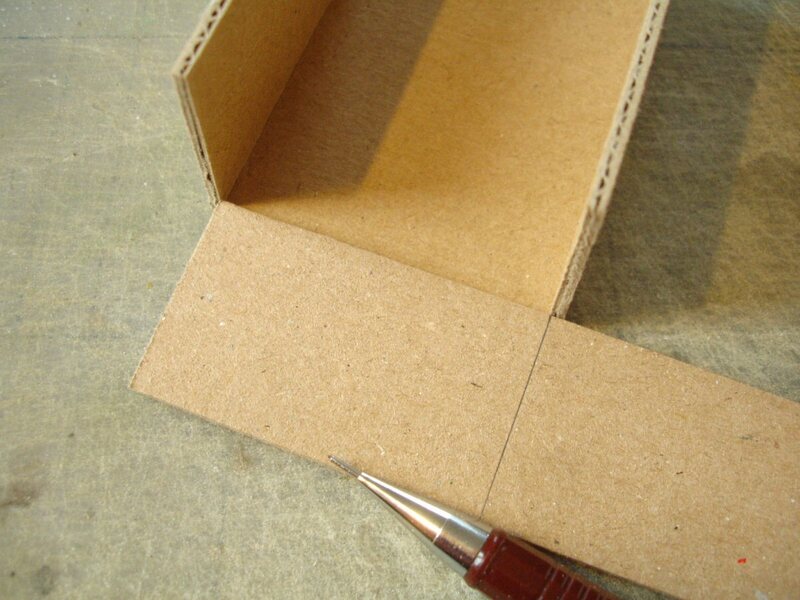 In the packaging industry card which is composed of one corrugated layer enclosed within a surface layer on both sides is known as single wall board and one of the thinnest is made to a 1/16th of an inch. I’m guessing this is the ‘Kraft board’ that’s available from Seawhite because this is, as close as I can measure, a little under 2mm. I had thought that the name was just a quaint variation on ‘craft’ implying that the board was for general-purpose creative uses, but it turns out that the ‘Kraft process’ is the name of an established method of wood-pulping which produces a particularly tough paper and ‘Kraft’, given by the German inventor of the process, denotes ‘strength’. In the first place it is one of the cheapest forms of card I’ve found. At University of the Arts London shops it costs £1.15 for an A1 sheet. Seawhite only normally supplies wholesale but they have a selling website www.artesaver.co.uk where a box of 25 A1 sheets will cost £24.80. Seawhite also supplies Cass Arts in London so it’s possible that it can also be found at those stores. As I’ve said, the surface is typical for recycled card .. very matt, even slightly dusty in look, and grainy, with the odd larger speck here and there. The overall colour, a light coffee-brown, is very uniform (not mottled or patchy) and consistent from one sheet to another. There is no visible distinction between ‘front’ and ‘back’ of a sheet. Against the light the surface shows a slight roughness, like ‘sugar paper’, but surprisingly the internal corrugations aren’t visible even under glancing light. The surface picks up grease from the fingers quickly and visibly, because it’s unsealed and very absorbent. It may be a matter of opinion as to whether this matters, but if you want to keep the material as clean-looking as possible while working you’ll need to wear cotton gloves. No exact thickness is provided by the supplier, but 10 pieces tightly pressed together come to 18.5mm thick, so for structural and scale purposes one can take the thickness to be c.1.85mm. Being hollow it is easy to cut through cleanly, though as one would expect cutting is much easier and smoother along the direction of the corrugations. Contrary to what one would expect though, the card seems to stay just as rigid in both directions so one doesn’t necessarily have to choose to cut in a particular direction for stability. It’s also very firmly bonded internally, so for example even very thin strips stay straight and intact. 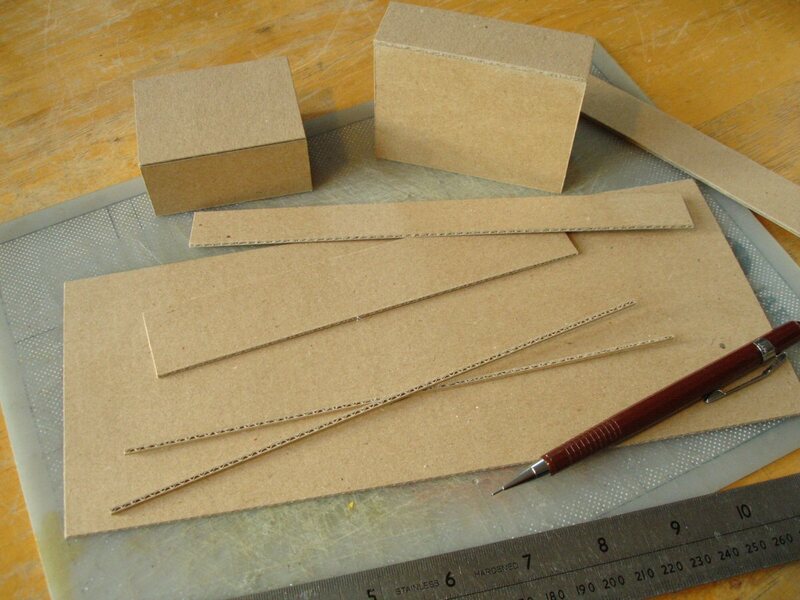 In fact, for something that’s basically just a hollow construction of heavy paper, ‘Kraft board’ maintains both its rigidity and coherence incredibly well! 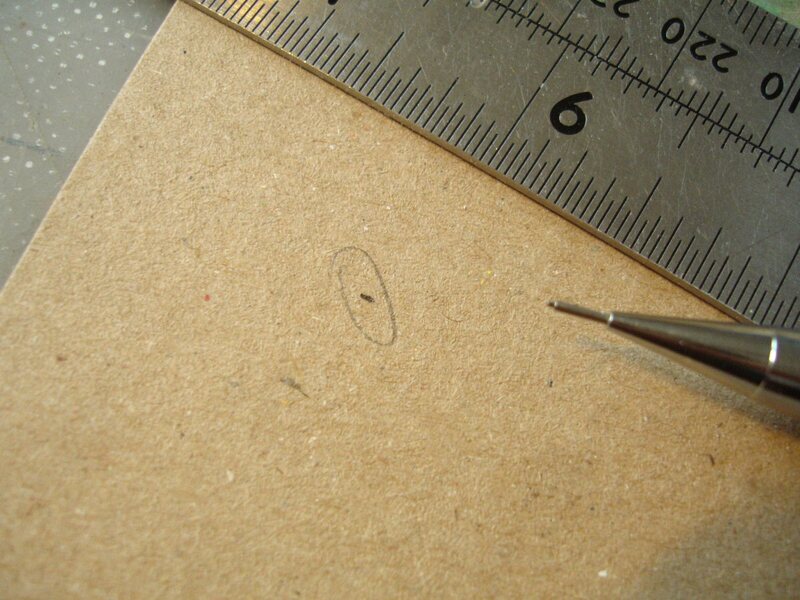 Because the surface is speckled it can be easy to lose pencil marks made for cutting, so I would recommend circling them lightly, as shown below. After cutting, these can be removed with a soft eraser. 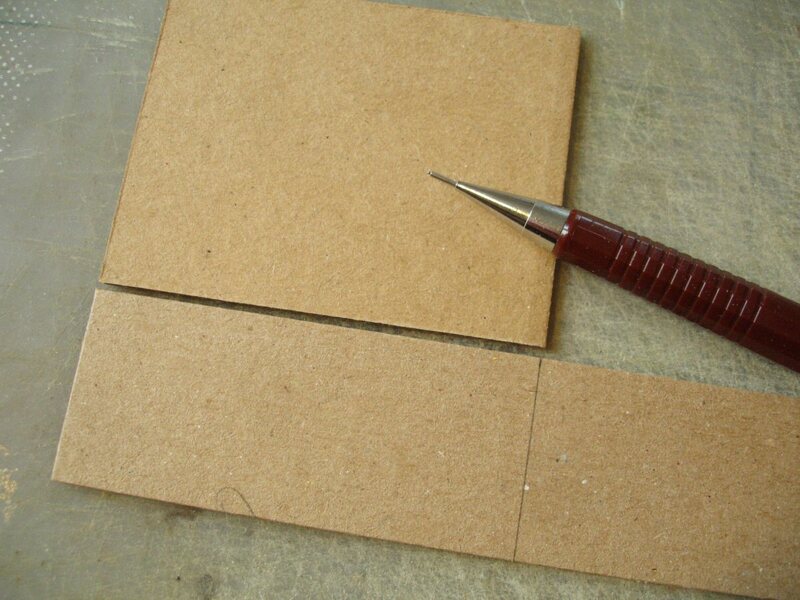 Despite appearing soft and easy to cut with a scalpel, ‘Kraft board’ is deceptive. The paper itself is very tough and needs a sharp point to cut it cleanly. The hard fibres in it will also blunt the tip of the blade very quickly. 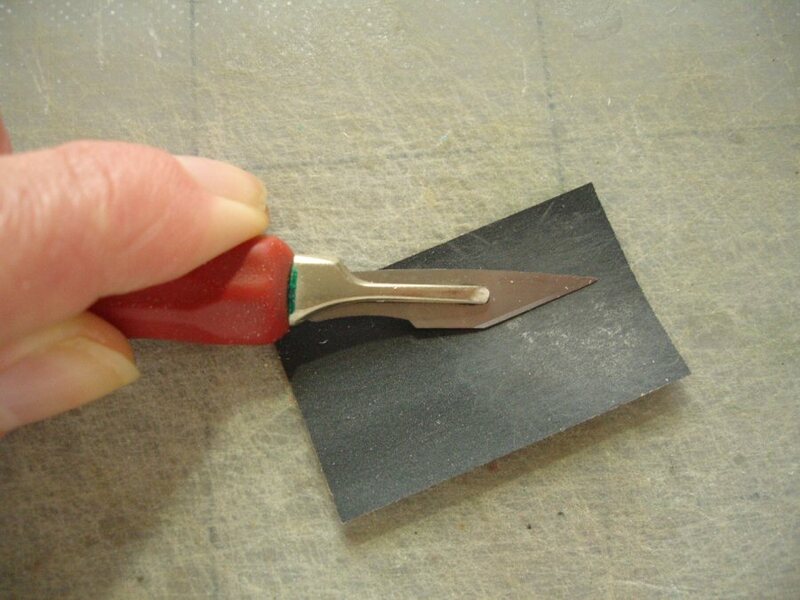 It would be senseless, and expensive, to replace the blade that often .. but sharpening just the tip on a piece of 800-1,000 grit wet/dry paper as shown will help. I always recommend patient cutting, i.e. starting with gentle passes and not trying to cut through in one go, but this is particularly important with ‘Kraft board’ otherwise the edge will compress or parts of the paper might tear. 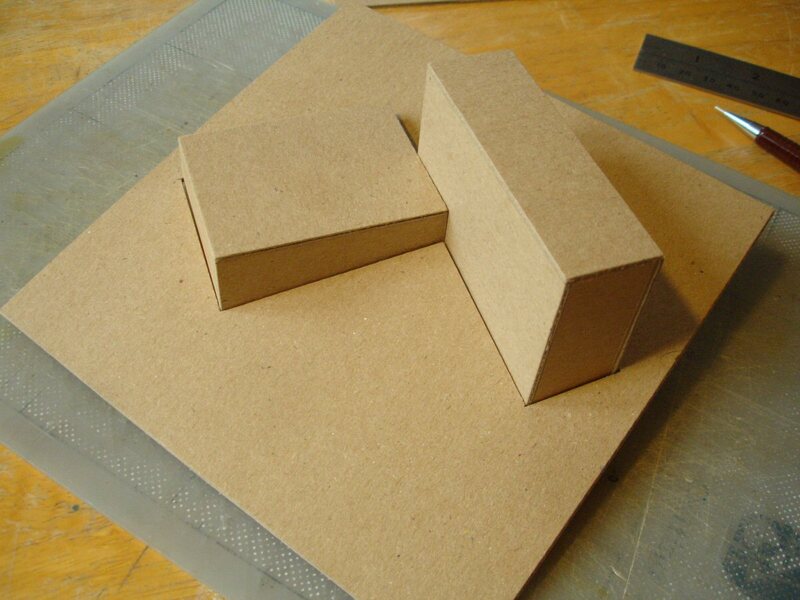 For more advice on marking out and cutting generally, see ‘Main construction’ in Methods /- Making realistic models. 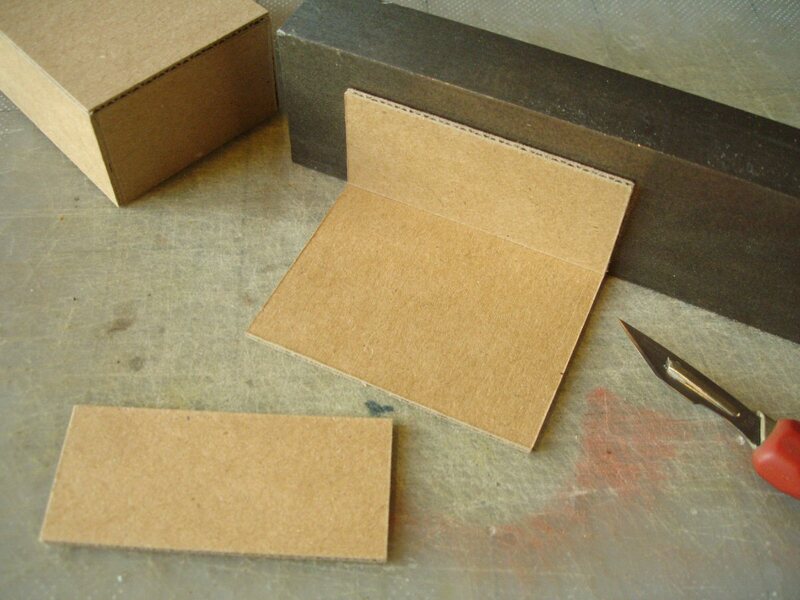 The following sequence of photos shows the steps, techniques and additional tools recommended for making a simple ‘box’ form, i.e. a building block comprising roof and walls. Although this is the simplest possible exercise, it illustrates many of the basics of effective construction with this material. The first advice is that, since the model is mostly viewed from above, roofs assume more significance so the overall look will be cleaner if these are complete and without seams (i.e. walls stuck underneath them rather than around). I’ve found that generally the cleaner way to build this type of model is the opposite of real construction .. building from the top downwards. I’d also recommend that the walls should be cut with the corrugation running from top to bottom, so that the corner seams are less obtrusive. The distinctive ‘zigzag’ patterned edge that occurs when cutting in the other direction cannot be completely avoided in the model .. and can sometimes be used to good effect! .. but it can at least be controlled with a little thought. In the photo below, the top piece has been cut together with a much longer piece for the sides, long enough for all four. This ensures that all four walls will be exactly the same height and that the box will stand well when reversed. 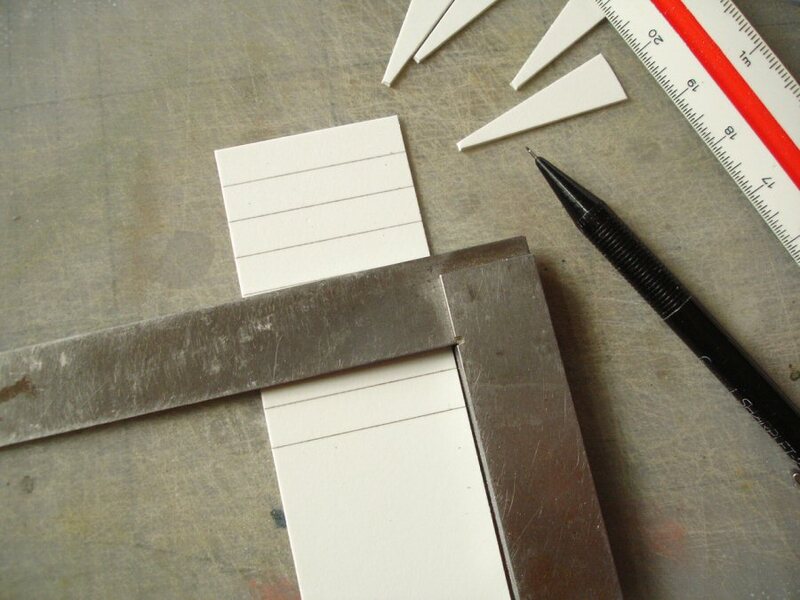 The next ‘trick’ is to measure from the cut roof and divide up the strip only as-and-when each piece is needed, rather than measuring/cutting all pieces out beforehand. This avoids many of the slight discrepancies that are bound to occur. I use solid metal blocks as supports for gluing. These ensure that the wall, shown below, can be positioned correctly on the edge and maintains a right-angle. Steel blocks like these are not available in D.I.Y stores but can be bought online at, for example, www.metalmaniauk.com The best glue to use when working with any card is Pva wood-glue because it’s strong, clean and allows for some repositioning. But better still are good quality wood-glues from Evo-Stik or Loctite rather than the weaker ‘school’ Pva. These make the work easier because they grab and set more quickly. Above, I’ve glued the two parallel walls first and waited a little for them to become firmer. Then I’m marking the length of wall which needs to be cut and inserted between them. Usually this results in the best fit. Below, the glue needs to be applied to this piece rather than the insert so that the glue isn’t squeezed out onto the surface when it’s pushed into place. Pva glue need only be used very sparingly with this type of card. Below, once the piece is inserted the work can be turned around and a flat surface used to level the wall into position. 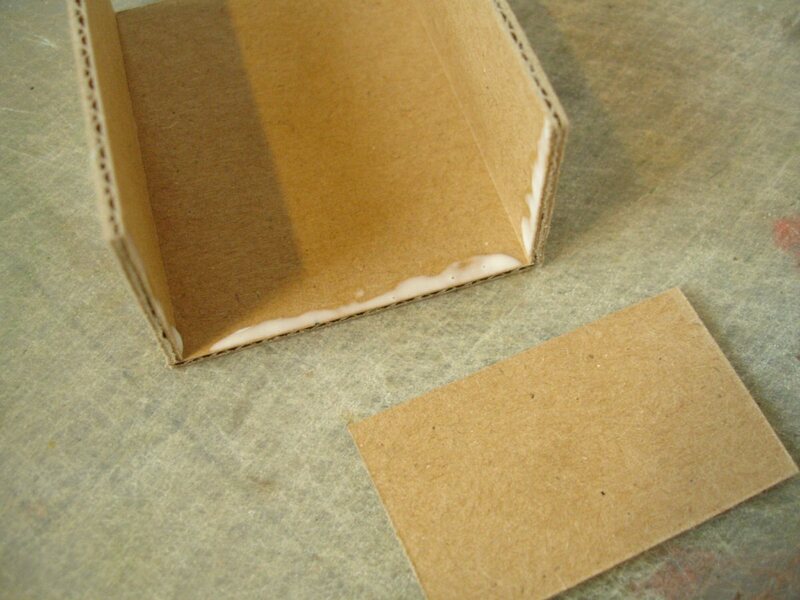 A good Pva glue will hold absorbent cardboard firmly enough for handling after a few minutes though it will take longer for the glue to fully harden. I’ve written more about these tools in other articles such as ‘Main construction’ which can be found in the Methods /- Making realistic models section, but I’ll repeat the main points here. 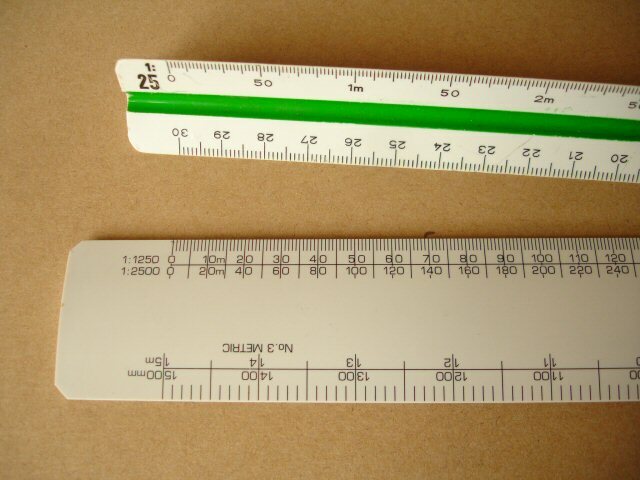 Scale ruler There are two types in common use for metric measurements .. flat, 2-sided and triangular, 3-sided. The flat ones may look more elegant and sophisticated, but my preference is for the triangular because they are often clearer, with bolder calibration. They are also a little harder to lose amongst the clutter of a work table. The one shown in the foreground below is actually more for interior or theatre design, the smallest scale included being 1:125. 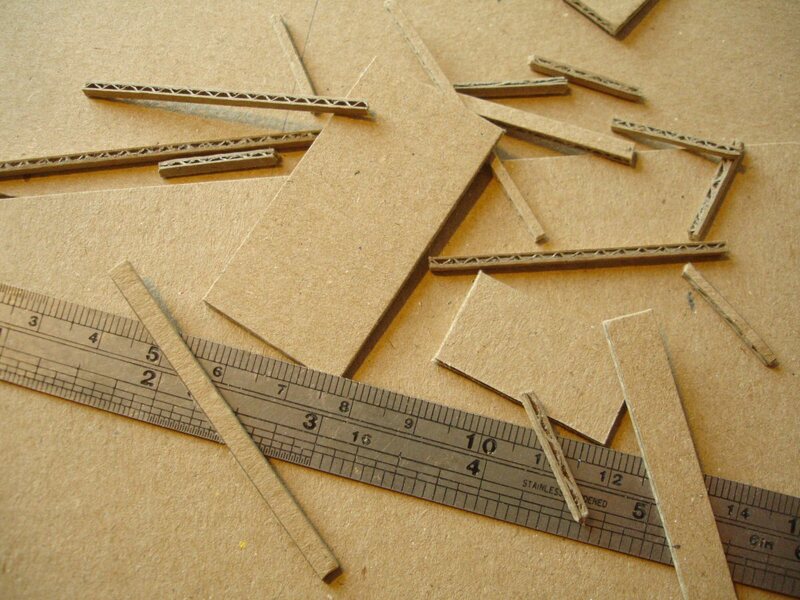 Architects’ scale rulers have a greater range, usually down to 1:2500. Because of this the scales are paired on each of the six edges i.e. 1:1250 with 1:2500 etc. If you want to read more on working with scale rulers see the article ‘Working in scale’ in the Methods section. Mechanical pencil It is essential to use one of these, shown in the photos above, to make a consistent, fine line when marking up for cutting etc. But this doesn’t need to be an expensive one .. the cut-price ones from any supermarket will do almost as well. I personally prefer to use a special type though which takes a 0.3mm ‘H’ lead, finer and harder than the usual ones, which gives better accuracy. 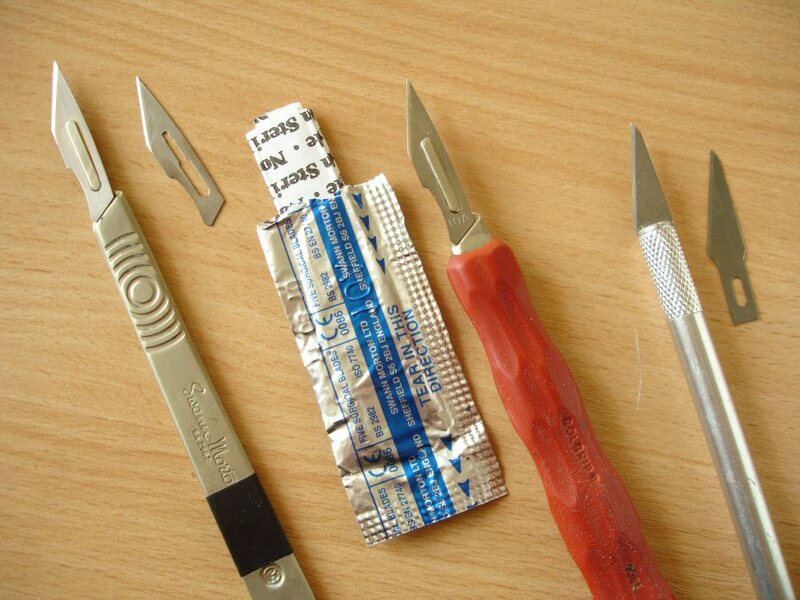 Scalpel or fine cutting knife I prefer a surgical scalpel, far left below, because it cuts better, is easier to control, and the blades can be more easily re-sharpened. These are made by Swann-Morton, the best handle size is No.3 and the best general-purpose blades to use are ’10A’. The more common type of fine cutting knife to the far right has a round barrel which is more difficult to keep steady and the blade wobbles more because it is less supported. There is one drawback in choosing the scalpel type, and this has started happening only in recent years. For some reason, perhaps because of cheaper manufacture, blades are almost impossible to slide onto new scalpel handles without the help of pliers. One should be able to do this comfortably by hand, but the fit is just too tight. Small try square The one in machined steel shown below is more properly termed an ‘engineer’s try square’ but other, usually 25-30cm ones can be found for general D.I.Y or woodwork. It’s possible to survive without one, but being able to check and mark out right-angles, especially repeated ones, like this can safe a vast amount of time. Cutting mat The size depends on the size of models you are likely to make but usually an A2 cutting mat is more than enough. It’s best to opt for the cheapest deal you can find if you need to save money because the ‘quality’ doesn’t really make any difference. What matters more is that it’s kept clean .. put aside while painting or especially supergluing because these will quickly make the surface less effective. Whichever brand or source, I would recommend one with a prominent centimetre grid as shown below, because this can help a lot when cutting parallels. Flat metal ruler A metal straight-edge is essential for cutting against and in my experience the best for this purpose are the cheaper, flat steel ones. These are normally available in four lengths .. 15cm, 30cm, 60cm and 1 metre. As with the cutting mat it may be difficult to determine which size will be needed most, but I would recommend that if you opt for a 60cm you really have to get an additional 15cm because it’s a pain having to manoeuvre the long ruler around for small cutting. A strip of masking tape on the back of the ruler, shown above, is essential to make it grip better. 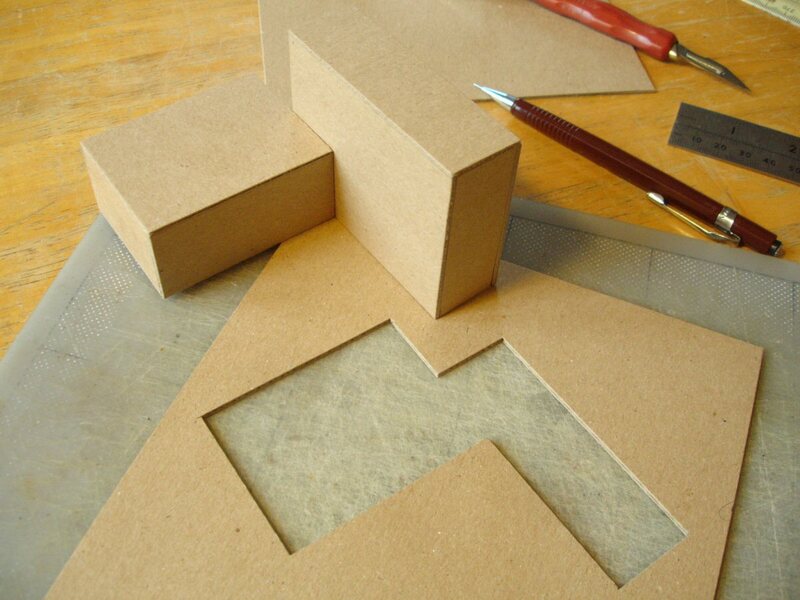 The special rigidity of ‘Kraft board’ makes it an ideal material for trying slotted, interlocking forms. This was how I put together the structure shown in the first photo and below, also in close-up. It is just a series of identical floor shapes and identical upright supports with slots cut so that they can interlock, and dependent on the stability this might not even need to be glued. It is by far the easiest way of achieving multiple storeys and uprights which are all reasonably aligned and straight! 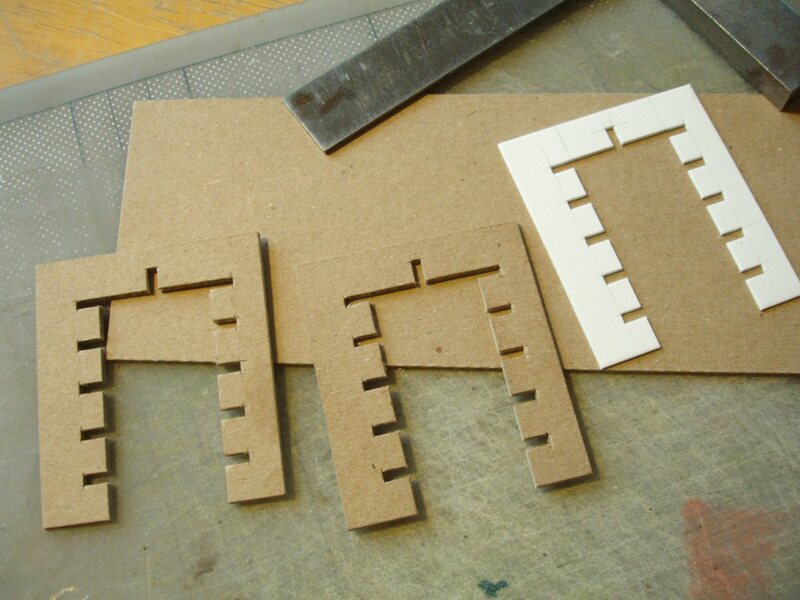 To achieve identical cut-outs I made Pvc templates first, around which each form is traced in pencil on the cardboard. I had to make the slots on the template a little wider to compensate for the extra width of the pencil line. 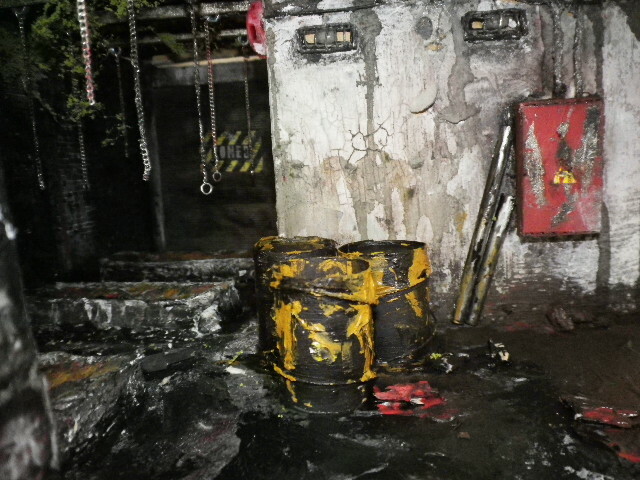 This might be a little clearer from the following photos showing a similar, earlier construction. It is common practice to indicate slopes or variations of the terrain in layers corresponding to the height levels on a contour map, as shown in some of the photos above. Once again this is easier from the top downwards, cutting out the smallest shapes first and using these as templates for the larger. I prefer to fix these together using evenly spaced pieces of strong double-sided tape, but Pva glue can also be used. 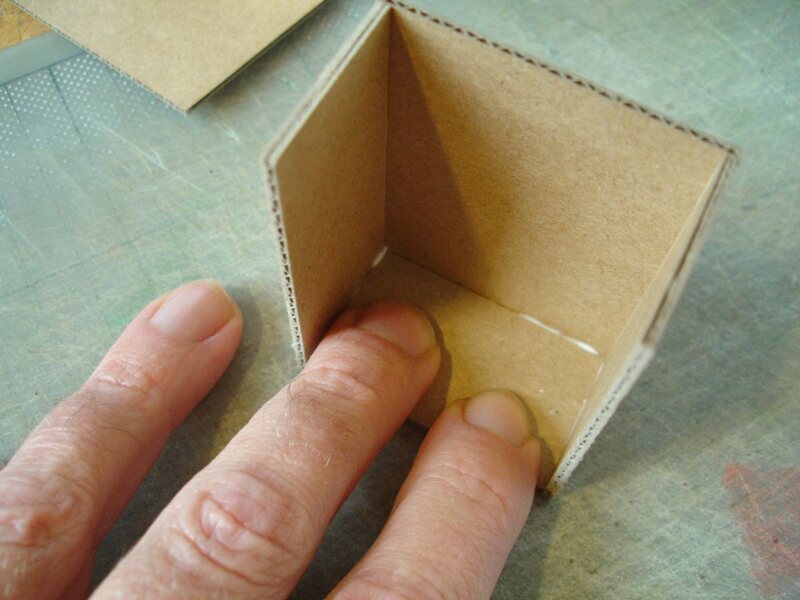 This should be applied in small, fairly widely spaced spots (spreading too much glue will cause the cardboard to warp) and ideally the layers should be weighted down while gluing. UHU can also be used for this in a similar way but this needs to be done quickly before any of the glue spots dry out too much. While working on these landscape layers I looked at another interesting way of creating a smooth gradient by constructing the building blocks first, cutting holes in the card and positioning this around them at an angle, as shown in the photos below. With a relatively simple model this would be a lot easier than sloping the bases of the buildings. Please note before you start reading this older post that I have long since included a version in my Methods section which can be accessed above. That version may have been updated or expanded since. For those who are new to working in scale and need some basic advice or just a simple explanation before starting, here is an overview. What I’ve often found is that although the principle of reducing an object in size is a very simple one, many people who haven’t done it before may assume it’s more complicated than it is. If you’re new to it, you can for example decide to make a model or a drawing of something using a simple reduction that can be calculated pretty much in the head, such as ‘half the size’, which means you only have to divide each measurement of the original by 2 (or in other words ‘in half’). If that’s still way too big for your purpose, it is just as easy (if you normally use centimetres) to calculate ‘tenth of the size’ by moving the decimal point of each original measurement by one place or ‘hundredth of the size’ by moving it a further place. You can even quite easily arive at ‘twentieth of the size’ by moving first the decimal point one place then halving! So already you’ve got the choice of four possible scales .. 1:2, 1:10, 1:20 or 1:100 .. which can be done fairly easily in the head! I’ll come back to why they’re written this way (at least, when using metric) later. But what if none of these size reductions, in other words scales, give you the size of model you want or allow you to fit drawings on standard sizes of paper? What if you reckon you need something in between, such as ‘twenty-fifth of the size’ or as it’s written, 1:25 which incidentally has established itself, at least here in the UK, as a comfortable scale for theatre design models and technical drawings? Most people would have to use a calculator to divide by 25 and doing this for each and every measurement would be painfully laborious! At some point in the past someone had the bright idea that having, as it were, a miniaturised version of a long tape measure to read from would save a lot of time .. and so the scale ruler came to be. Most people who regularly have to model or draw in scale use one of these to avoid mistakes even when the reduction is a simple one. None of us are strangers to dealing with scale, and we deal with it all the time .. everything we see, we see in scale! Unless our eyes are glued up against an object, we see that object at a distance, which makes the image we receive of it smaller than lifesize. We are so used to this that we don’t .. we can’t afford to .. think about it consciously. When we see an object at a distance we don’t question that every dimension of that image (not only height but width etc.) is reduced according to the same proportion or ratio,that is, if the image we receive is half the height that it actually is the width will also be half and the size of every detail will also be half, etc. Everything is divided by the same amount .. in this case by 2. In everyday life we don’t have to be conscious of exactly how much smaller than life-size that image is, but in a way our unconscious mind is and uses that calculation to help judge how far away that object is. Also when practised artists do life-drawings from a model at a little distance from them they usually don’t have to take a tape measure to the model, reduce all those measurements by the same proportion and map out the figure on the paper like a technical drawing. They use the natural awareness of scale we all have to gradually piece together a scale drawing freehand, relating the size of first one part of the figure to another or the general whole to the details, and so on. In other words, we all have a very natural and in-built sense of scale, which we use all the time. So you could describe this smaller size in a number of ways i.e. you’re seeing it ‘half as big’ or ‘half-size’ or even ‘twice smaller’! That’s where one of the first problems starts, because although I’d guess that most of us understand the phrase ‘half as big’ immediately, we may have a moment’s difficulty with ‘twice smaller’ whereas ‘ten times smaller’ becomes actually easier to understand. The ‘official’ language of scale (the way it’s officially expressed) attempts to avoid the kind of language difficulties which occur between speakers of the same language, let alone between different languages! Also, when recording measurements, it is accepted that anything to do with measurements should be written, not as words, but numerals. So ‘half-size’ would be written as 1:2 (spoken as ‘one to two’) where, in a way, the colon dots are just replacing the dash in ‘1/2’ when written as a fraction. So, as another example, 1:25 (spoken as ‘one to twenty-five’) should be more easily understood as just saying ‘1/25’ i.e. the drawing or model is ‘one twenty-fifth’ the size of the original .. or ‘twenty-five times smaller’. I find that often the insecurity that many people have when getting used to working in scale for the first time comes mainly from the way it’s written or referred to i.e. that it’s not totally clear what either the two dots or the ‘1’ (or the ‘to’ when spoken) mean here. Understanding it as just a different way of writing a fraction, ‘1/25’, may be one way of understanding it better. In accepting exactly why it’s written then as ‘1:25’ rather than ‘1/25’ one has to understand that the colon is there to convey that it’s a ratio, in other words a fixed relationship. People who do a lot of mouldmaking and casting .. or people who do a lot of cooking! .. are used to these. For every ‘certain number’ of eggs in a pudding mix there has to be another ‘certain number’ of spoonfulls of flour. Every ‘certain number’ .. in this case a baseline 1 .. of centimetres you measure on your piece of card becomes, means or relates to 25 of the same in the real thing you’re modelling. For the moment we’re staying with metric i.e. centimetres and metres, but I will be speaking about Imperial inches and feet later. 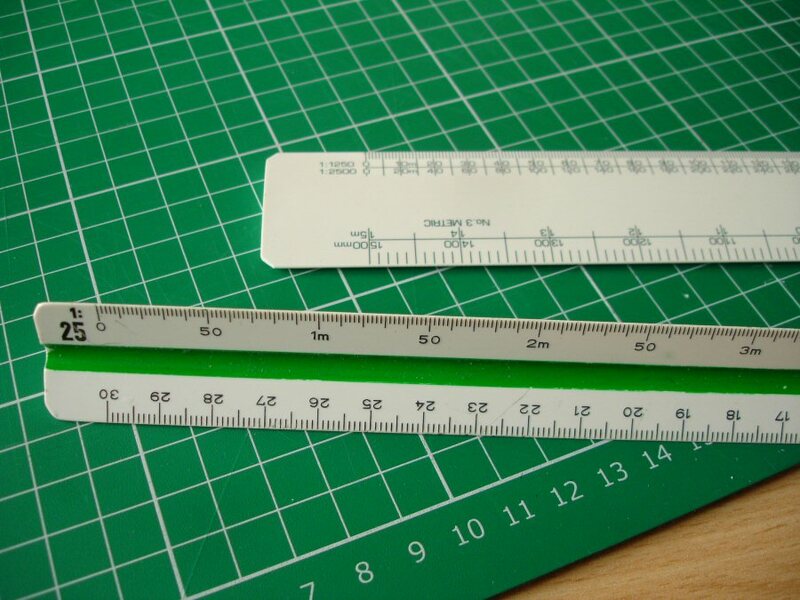 So let’s look at a standard scale ruler suitable for working in 1:25 scale and see how it helps. Above is the most common and easiest type, a ‘triangular’ rule which is able to present six different scales for us, one on each of it’s six edges. 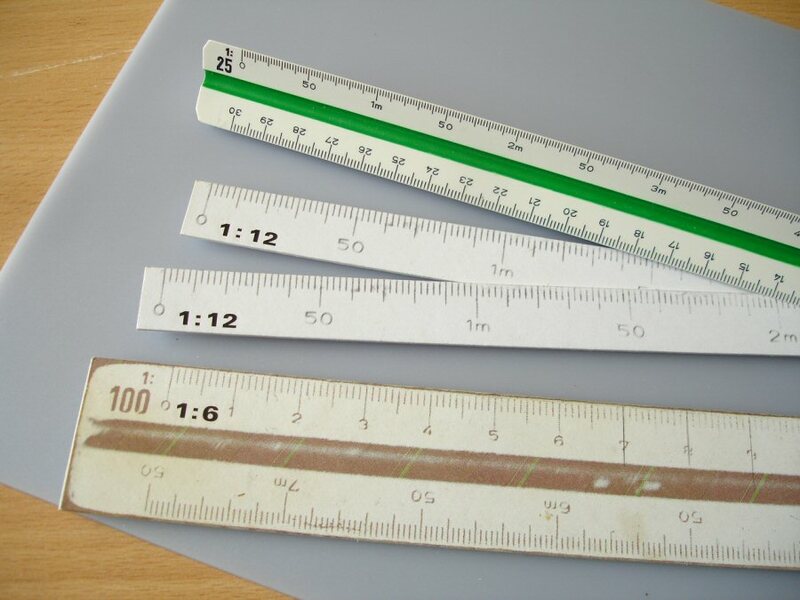 These scale rulers usually include 1:20, 1:25, 1:50, 1:75, 1:100 and 1:125 ( the 1:100 ‘scale’ is basically just a regular centimetre rule in which the centimetres can be read as metres. In any event it’s useful to have a regular rule included ). The usual plastic type above has a different colour (green, red, black) to assist in finding the relevant face more quickly. These cost between £6 and £10 in the UK at the moment. The metal one behind it, found in a cheap DIY tool shop, costs a lot less and does its job just as well, but the calibrations wear off a lot quicker because they’re just printed on. 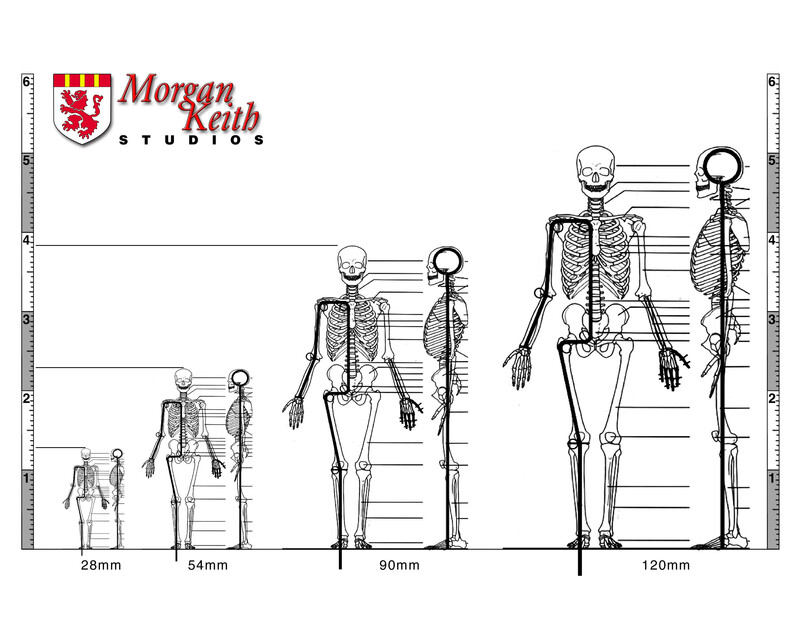 Both clearly show the scaled size of 1metre, 2metres and so on .. up to 7.5metres. Both clearly indicate 50cm divisions and the smaller divisions after that represent units of 10cm. The very smallest divisions within those .. this is important to remember .. represent 2cm each, not 1cm since this would be too small to display. With the right scale ruler to assist, working in scale really should be as simple as reading from a regular tape measure. But unfortunately one might have to hunt around a bit for the right scale ruler to use. Many art or graphic supply shops stock them but there may be more demand for the type shown above (which is also available in the triangular form) which is calibrated for working in much smaller scales. The numbers along the 1:2500 scale above are the number of metres represented and the smallest divisions therefore represent 2metres. As ‘luck’ would have it this can be used for 1:25 work in place of the proper scale ruler because the calibrations work out the same .. one just has to think of it as representing centimetres rather than metres. So ‘100’ on this readout is 100cm, in other words 1metre at 1:25 scale. A lot of people find it no problem to mentally switch, but it’s certainly much easier to misread or make other mistakes using one of these and it certainly doesn’t help that there are also usually two different scales cohabiting the same edge, as you can see here. I would recommend that if you can’t get the ‘quality’ scale ruler in exactly the scale you want it’s better to go for a cheaper metal one. In the UK I’ve seen these in £shops and Maplin, sometimes Robert Dyas and B&Q. A word about ‘describing’ scales i.e. referring to them in the correct way! Above I’ve described 1:2500 as a ‘smaller’ scale than 1:25 .. which is correct! A 1:2500 scale model of an 8 metre long fire engine will be much smaller than a 1:25 model of the same. But the 1:2500 fire engine may be part of a modelled street which conveys a larger area than a 1:25 model can. Although people often refer to the 1:2500 model as the ‘larger’ of the two, especially if it is physically larger than a 1:25 scale portion, it is better not to because it becomes just another cause of confusion! How to choose the best scale to work in? I’m often asked by people ‘What scale should I make my model? .. and I wait patiently for more information to come, i.e. the purpose, the context. Sometimes that’s it, almost as if there’s only the choice of a few acceptable scales in the world. To be fair, there are scales that are more prescribed or advantageous in certain circumstances. 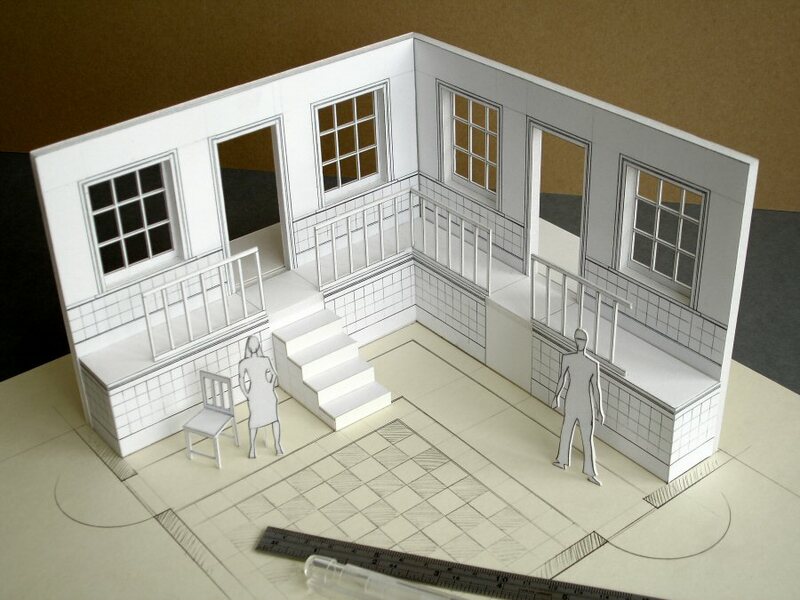 Theatre design models in this country are always 1:25 scale. If they were any bigger the model-boxes (representing the whole stage space) wouldn’t pass through doorways. If any smaller they would lose in terms of presence and detail. Puppets for stop-motion animation often range from 1:8 to 1:6 ( or ‘2 inches to the foot’) because generally this is the smallest one can go before losing control or sublety in their movements. Also if one’s working in a medium where colleagues or clients are used to a certain scale is it wise to work against the grain by offering up an unfamiliar one? What I mean is that, there may be conditions imposed on the scale one chooses but otherwise one has the freedom to choose the most appropriate scale oneself. Often this is more a question of how much space one has, balanced with how much one wants to convey and, especially in the case of a model, how much ‘presence’ one wants it to have. In traditional, hand-drawn technical drawing ‘available space’ starts with the size of drawing board one has and therefore the sheet size. If for example one is drawing up a whole room (whether a theatre set or interior design) the minimum ‘kit’ of information needs to consist of a groundplan and elevations (that is, front-on views) of all walls. It’s ideal if these can all be arranged on one sheet, so that elevations can be quickly related to the groundplan. Best of all is if groundplan and elevations can be arranged on the paper like a hinged box, with the groundplan in the centre and walls folded flat around it. This also means that wall lengths and positions of windows, doors etc. can be taken directly from the groundplan when drawing up, which is important because it avoids the possible mistakes that occur when elements have to be drawn in separation. If you can fit all this on one piece of paper at 1:25 scale then that’s great because you can include quite a bit of drawn detail with it. But often it’s not possible, so for groundplans or general overviews 1:50 is often used in the theatre here (or 1:48 ‘quarter inch to the foot’ in film and television .. and I ‘comment’ on that later!). But the point here is that, although there are common practises ( tried, tested and above all familiar methods) that it is often advisable to go along with, in the end any practical solution that the one doing the work (making the drawing or the model) comes up with (including using a different scale if need be) should be acceptable if the end result communicates clearly! This, I’m assuming, you’ll do without question/choice if you live in the USA, Liberia or Burma where feet and inches are still the standard units of measurement. This measurement system is known as Imperial. If you live in Germany, or most other European countries, you’ll never have had cause to think in any other way than metric. If you live in the UK, on the other hand .. well, according to Wikipedia we have ‘only partially implemented’ the metric system. That’s a very polite way of putting it! We ‘officially’ changed from the Imperial system of measurement to the metric in the early 1970s but even school rulers still commonly include inches; many people (even those born since) still refer to people’s heights in feet, and carpenters still refer to ‘two-by-ones’ meaning standard timber measuring 2 inches by 1 inch thick! Here you need knowledge of ‘miles to the gallon’ in order to choose a car, confidence in kilometres if you want to drive it and an understanding of feet and inches if you go under a low bridge! This state of things is classic ‘Heath Robinson’ (or ‘Rube Goldberg’ if you’re Imperial), defiantly British, and what’s more there doesn’t appear to be an end in sight. Whereas former Chancellor of the Exchequer Lord Howe spoke out in 2012 about the ‘confusing shambles’ caused by still using both Imperial and metric systems for different things and called for a complete changeover to metric, on the other hand earlier this year plans were being drawn up for a new primary school curriculum reintroducing more awareness of pints, pounds weight and miles by emphasizing ‘parts’ of the Imperial system once more. Politicians are concerned that young people are becoming increasingly confused .. but as yet there has been no unified action to prevent it! Whether you call it a defiant ‘freedom of choice’ or just a shambolic mess, one area which illustrates both aspects in the UK is in film and television design. For reasons which I still don’t fully understand it’s still a common practice here to draw up (and therefore model up) set designs in feet and inches. When I’ve asked why, no one has given me a convincing answer! Some say it’s because of the ‘American market’ but what does that have to do with designing and building things here? Others suggested to me (a while ago now) that it made sense because structural timber and plywood sheets for building are still conceived in terms of feet and inches (i.e. the ‘two-by-ones’ I mentioned or the 8ft x 4ft standard size for many sheet materials). But, so what? By now we should all be used to reading 2440x1220mm in place of 8ftx4ft and most of the leading hardware suppliers such as Wickes don’t even put feet and inches on their websites anymore. But returning ..finally!.. to the main point here, if you are working in feet and inches for whatever reason, you have to use a scale that makes sense with, i.e. conforms to and makes use of, the way feet are divided. Because there are 12 inches in a foot the only scales that will work smoothly will be those that are easy multiples of divisions of 12. You try dividing a measurement such as 3ft 8inches by 10, if you’re not sure what I mean! It would never have occurred to a Victorian craftsman to work in 1:10, 1:25, 1:50 or 1:100. What would have occurred quite naturally would be to make one inch, half an inch or a quarter-inch on their measuring ruler represent ‘1 foot’ giving the scales (as we might describe them now) 1:12, 1:24, 1:48 and 1:96. They would be understood and expressed, as they commonly still are now, as ‘one inch to the foot’, ‘half-inch to the foot’ or ‘quarter-inch to the foot’ and so on .. or even abbreviated to just ‘half-inch’ or ‘quarter-inch’. Scaled measurements can therefore be measured using a regular ruler, up to a point, and as long as the inches on the ruler are divided into quarters and eigths. But it’s easy to miscalculate, because for example if you want to find the length of ’27ft 6inches’ at ‘quarter-inch to the foot’ scale, of course you can do it, but you’d first have to divide the 27 by four, hold that 6inch length on the ruler remembering that it represents only 24 of those feet and then add the remaining three-quarters, and then the one-eighth! Generally only the ‘one inch to the foot’ 1:12 scale is comfortable using a regular ruler and for the others there are .. as I say .. scale rulers which make the task easier! 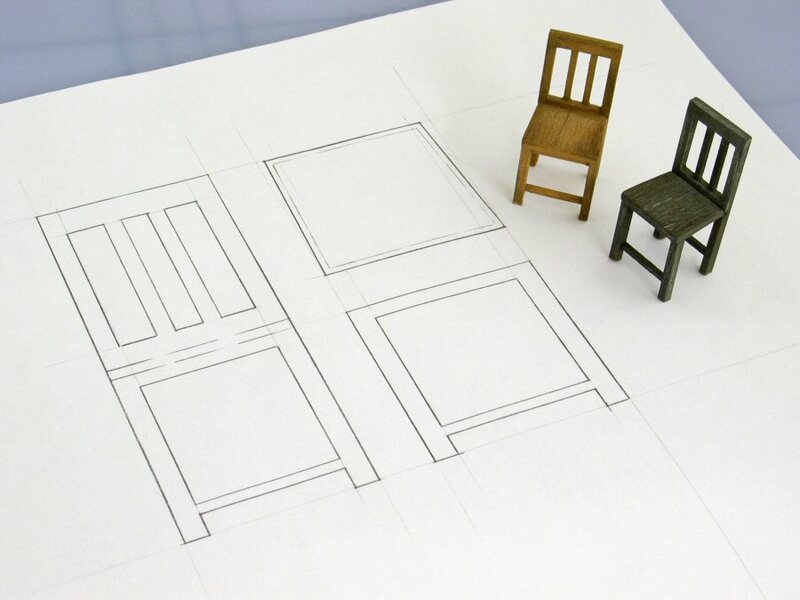 When I’m working with theatre design students I always advise them to design/plan furniture first by drawing it at a larger scale, such as 1:10, before reducing it on the photocopier to 1:25 for the model. It’s just too small to draw with any control or accuracy at 1:25! But when I ask, as a bit of a test, whether anyone can tell me what percentage of reduction is needed on the photocopier to convert a 1:10 to 1:25 I can almost hear all minds in the room turning to jelly. The answer is 40% .. but how does one get that? If I ask what the percentage of reduction is for changing a 1:10 drawing to a 1:20 there is usually more response. Yes, it’s 50%, because 1:20 is half the size compared to 1:10. Most of us would be able to work this out using a kind of logic rather than actual division of numbers because it’s a simple relationship, but let’s see whether the numbers themselves can be used to give us the same answer? Divide the ‘destination scale’ 20 by the ‘start scale’ 10 and we get 2, which in this case represents how much smaller it is i.e. ‘twice as small’ or ‘half size. Divide 2 into 100 and we get 50, which can now be used as a percentage. So does this work for any set of numbers or is it just a lucky coincidence? Going back to the previous question, converting 1:10 to 1:25 .. dividing 25 by 10 gives 2.5 (1:25 is more than twice smaller than 1:10). If 100 is then divided by 2.5 it gives 40, so 40% .. which is right! Does it work the other way? Enlarging a 1:25 drawing to make it 1:10 scale? .. dividing the ‘destination’ 10 by the ‘start’ 25 gives 0.4. Dividing 100 by 0.4 gives 250, which is right as 250% on the photocopier. In fact, this starts off much the same as the way to calculate any enlargement or reduction using actual measurements. For example if one just wanted to change the length of something from 8cm to 13.5cm and wanted to find the percentage .. 13.5 divided by 8 gives 1.6875. But here instead of dividing this by 100 it is multiplied by 100 (just moving the decimal point) giving 169% rounded off. If you divide it by 100 instead by mistake, you get the percentage of reduction needed to convert in reverse, from 13.5cm to 8cm. Usually when doing this kind of thing I don’t analyze the process that much.. all I need to know that I have to divide the larger number by the smaller if I’m enlarging, and the smaller number by the larger if I’m reducing. So make a note of this (much simpler) formula whenever you need to change the scale of something or reduce/enlarge to a specific size. 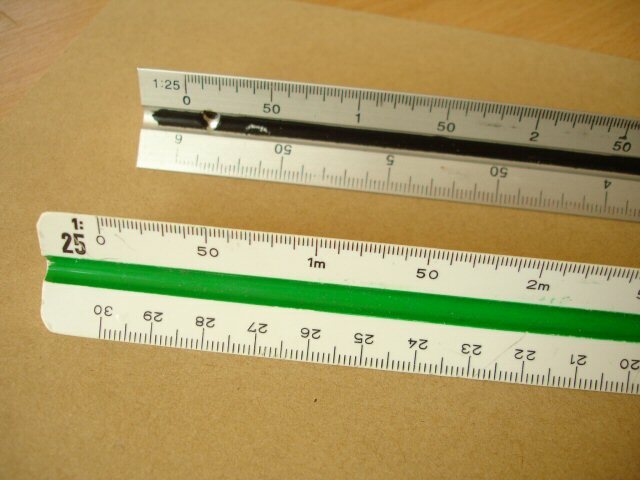 Having the formula above, together with either a standard scale ruler (or clearly defined normal ruler) and access to a photocopier, means that one can easily create one’s own custom scale ruler no matter how ‘peculiar’ the chosen scale might be. For example, puppets for stop-motion animation are often made to the scales 1:6 or 1:8. But one can’t buy a scale ruler which deals clearly with these scales. Some might argue that since these scales are derived from ‘feet and inches’ (1:6 is just another way of writing ‘2inches to 1ft’ ) the solution is to work in inches and just utilise a standard ruler as a scale ruler. But no, this really isn’t that simple or comfortable! For example if you are thinking about a 6ft 2inch character at 1:6 scale the feet are easy enough to find .. 12inches on the standard ruler .. but the remaining 2inches can’t be marked with any accuracy because inches on a standard ruler are hardly ever divided into twelfths! I prefer to keep things metric, and all I have to do is photocopy either the 1:10 face of my scale ruler (or the centimetres on a normal ruler) at a different percentage. So for example, if I want to make 1:10 into 1:6 it’s .. ‘start’ 10 divided by ‘destination’ 6 multiplied by 100 which gives 166.66 .. so 167% on the photocopier will be as accurate as one needs to be. I usually spraymount this onto a card or plastic strip, as below, to make it last. ‘Taking liberties’, by the way, applies to models .. but certainly not to technical drawings! Perhaps I should better ask ‘When is it important to keep to scale, when is it not so important and when is it actually far better not to?’. It depends on the purposes of the model i.e. the use to which it’s going to be put. Sometimes this is integral to the medium. For example puppets, whether for stop-motion animation or traditional live performance, rarely conform to normal human proportions. If they did their heads and hands would be too small to be easily workable or have enough visual impact especially from a distance. The fact that the puppets have bigger heads and hands in relation to their bodies makes the scaling of settings and props more difficult to decide and it may even have to vary for different elements. For example the height of a doorway would have to be decided by considering the overall height of the puppet and adding a bit. In this case doorway and puppet height have a ‘realistic’ size relationship. But if the puppet uses a telephone as a prop and it’s sized according to this overall height the receiver will look oddly miniscule when held to the puppet’s ear! Scale in stop-motion animation is often a mish-mash and we don’t have a problem accepting that, perhaps because most of us grew up acting out scenarios with disproportionate toys. This fluctuation of scale and proportion is one of the things that gives stop-motion animation its charm. Contrast this with any design model made to convey the intentions of the designer clearly and accurately, particularly those communicating the use of space. In these cases scale means nothing if it is not consistent! Unless there’s consistency, and in sufficient significant detail there’s little chance of either viewer or designer being able to judge the full effect of those intentions properly. The only freedom from scale in these cases is perhaps the choice of which details of decoration, texture or colour are really significant. 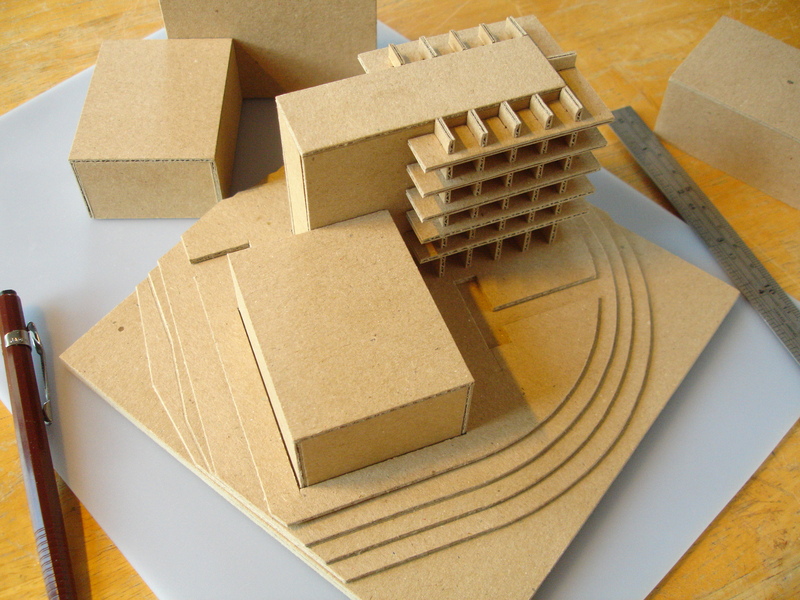 For example architectural models meant for final presentation of a design are very precise in terms of measurements but ‘realistic’ colour or texture are often bypassed in favour of a more aesthetic or abstracted finish (such as blank white or wood veneer) which, it is argued, will focus the attention more on form. The case is similar with so-called ‘white card models’ in film or television set design. These models are meant to convey a very clear and accurate idea of, not only the overall amount of space a set will take up but how it can be used for specific things. These include the positioning of actors, actions within the space and the remaining space available to position cameras, lighting and sound equipment. Any obstructions such as pillars, anything jutting out from the walls and even the smallest steps or variations in the floorspace need to be faithfully rendered so that they are not overlooked when filming is being planned. The emphasis is on all the practical considerations and as long as these are served it’s less important for this type of model to look convincing in terms of texture and colour. 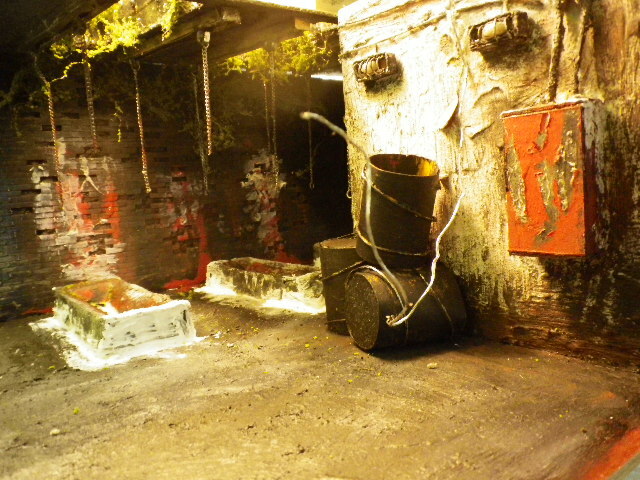 Finished set design models for the theatre have a similar function in that they must convey the performance space as clearly and accurately as possible so that all, especially the director, can judge what can be done in it. But traditionally they are also miniature replicas of the set, not only accurate in scale but complete in terms of colour and texture. For these, all details could be considered ‘significant’ .. the disarray of books on a central table, the crumbly matte surface of an ancient wall or the right kind of curve on a tiny rococo chair .. because a set design is the sum of many visual decisions working together. If scale is unintentionally wrong, no decision can be made as to how it’s going to work and unfortunately it can often seem like an ‘all or nothing’ task because just one out-of-scale element in the composition can upset the whole. 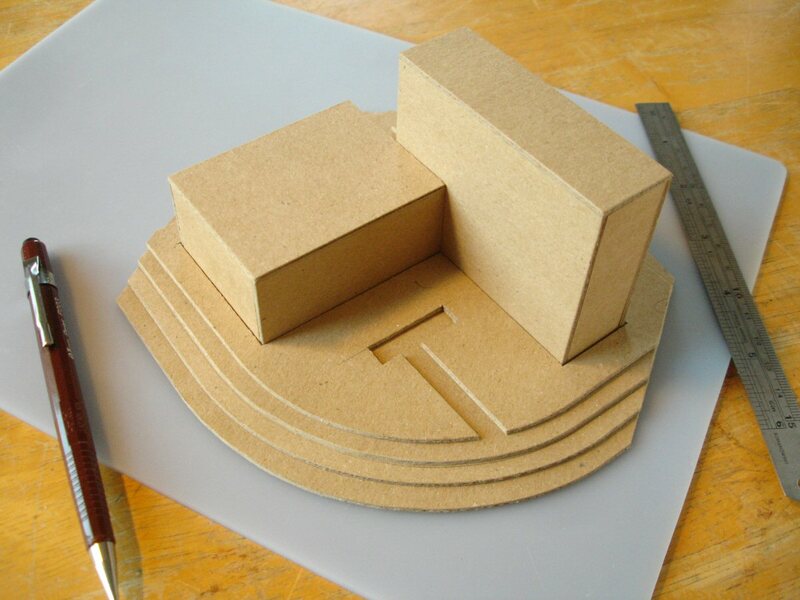 I say more about the purposes and the benefits of models in theatre design in my post Why make models? from March 6 2012. I’ve said it can ‘seem like’ an all-or-nothing task at times but In fact there is, and should be, freedom to mess with scale without the model losing its power to convince! I’ve always felt, and said, that clever suggestion often has more power to convince than slavish depiction .. and it can be a lot quicker! For example, it generally works very well when real sand, or real woods such as obeche, bass or balsa are used to convey those surfaces in the model. Strictly speaking those materials are out of scale but if one were able to render them in exact scale they would hardly be readable! When trying to model trees it would be senseless to do it leaf-by-leaf .. impractical timewise, but in the end the effort would also be counter-productive. We don’t really experience the ‘look’ of real trees leaf-by-leaf, but rather through the general appearance of the ‘clustering’. Leaves are translucent anyway, so any attempt to recreate them with solid materials and paint is rather doomed from the beginning! 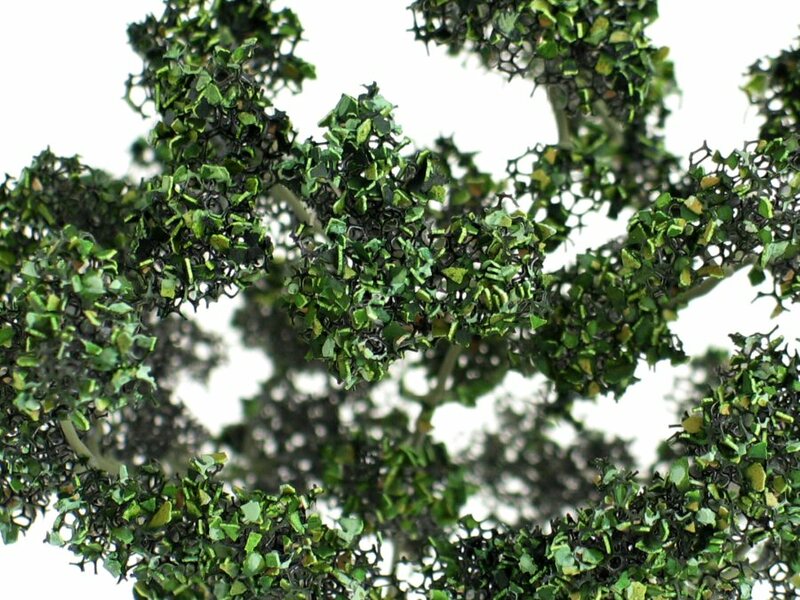 Trees can be effectively depicted by choosing a material which ‘clusters’ in the right way, rather than read as individual leaves in exactly the right scale or shape. I’m still looking around for the ideal material in translucent greens which can be chopped or granulated but in the meantime my preference is using crushed eggshell shown below which, once applied, can be tinted with watercolours. Below are photos taken by Marianna Szekely of her model for a film design project in 2012 at Wimbledon College of Art, London. I feel they illustrate how one can be free and ‘painterly’ in tackling the essentials of surfaces and significant detail, but still achieve a result that is as a whole unquestionably real! As in a good ‘Impressionist’ painting, scale and proportion form a disciplined framework upon which surface qualities can be played upon more suggestively.